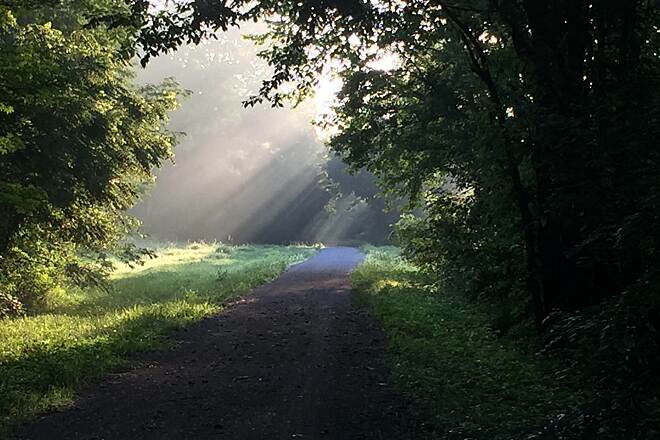 At nearly 240 miles long, Katy Trail State Park spans nearly the full width of Missouri and is the country’s longest continuous rail-trail, intersecting with rural farmland, scenic small towns, and centers of commerce and government on its route paralleling the Missouri River. Along the way, it invites its walkers, runners, and riders on a journey to explore the history of the state. 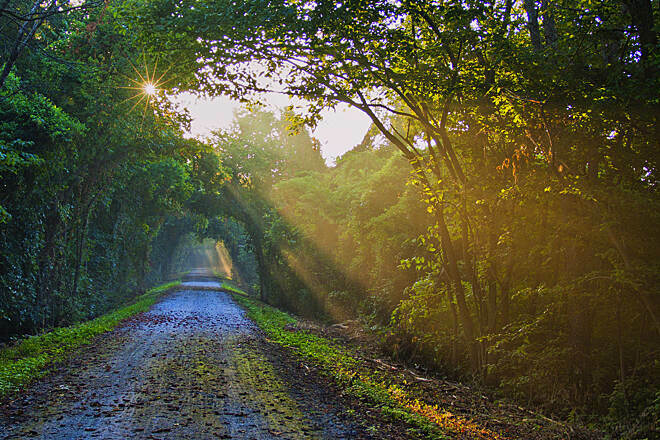 The Katy Trail is in the Rail-Trail Hall of Fame and is designated a Millennium Legacy Trail. 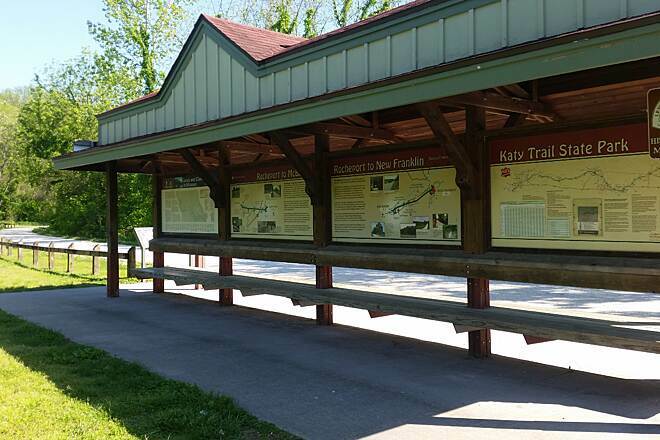 On the east side of Missouri, the trail officially begins in Machens at mile marker 26.9 (the Katy Trail follows the old railroad mileage system, based on the former rail line’s genesis in St. Louis). 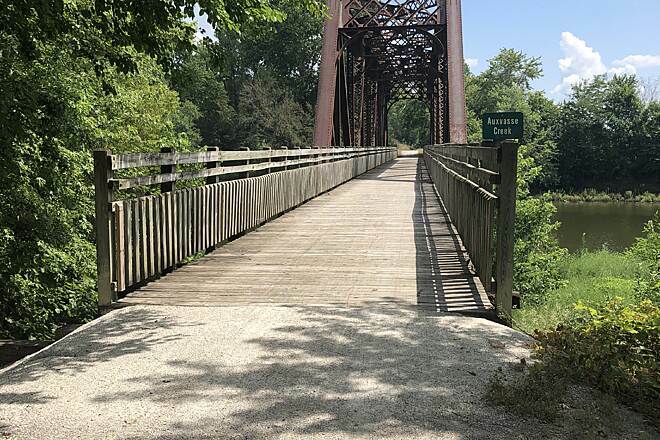 To access this endpoint, trail users can park at the Black Walnut trailhead at mile marker 29 and bike or walk in past adjacent agricultural fields. 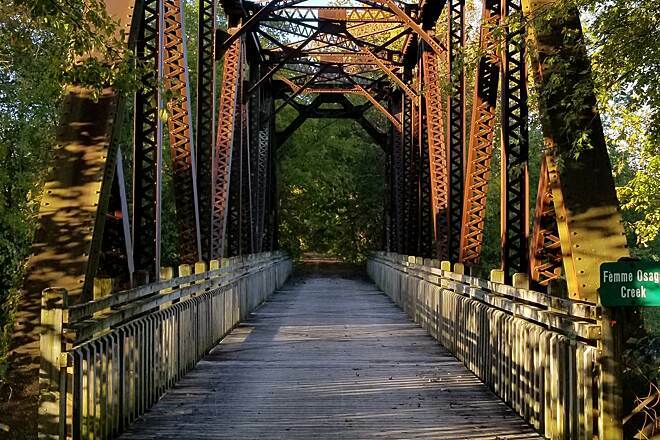 Many users choose instead to jump on at mile marker 39.5 in the historic town of St. Charles, where the trail threads between the state’s first capitol building and a restored depot building. Trail riders can take advantage of trailside businesses here, including a bike shop, café, brewery, and several historical B&Bs. 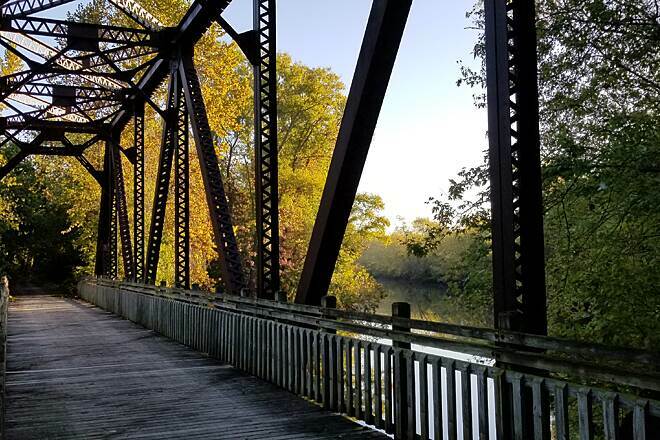 The trail continues along the riverbank to mile marker 66.3 in Augusta, which features a brewery and a bike shop right next to the trail, as well as several scenic wineries and B&Bs just up the hill. 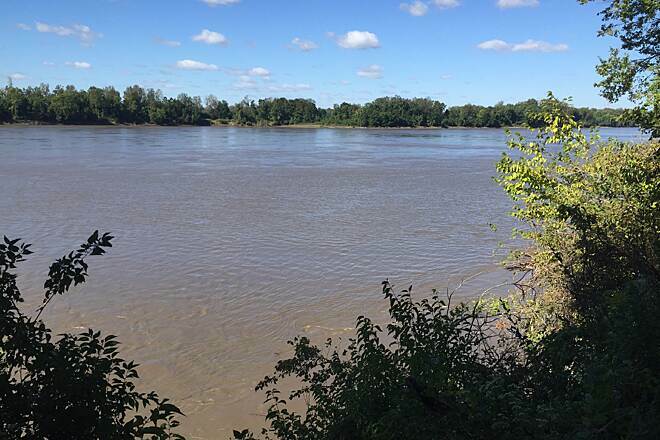 It continues on through fertile floodplains to Dutzow (mile marker 74) and McKittrick (mile marker 100.8), both of which provide jumping-off points to catch the Amtrak Missouri River Runner train across the river in Washington and Hermann, respectively. With advance reservations, cyclists can bring their bikes aboard for a $10 fee. Equestrians can ride horses on this stretch between Portland (mile marker 115.9) and Tebbetts (mile marker 131.2). 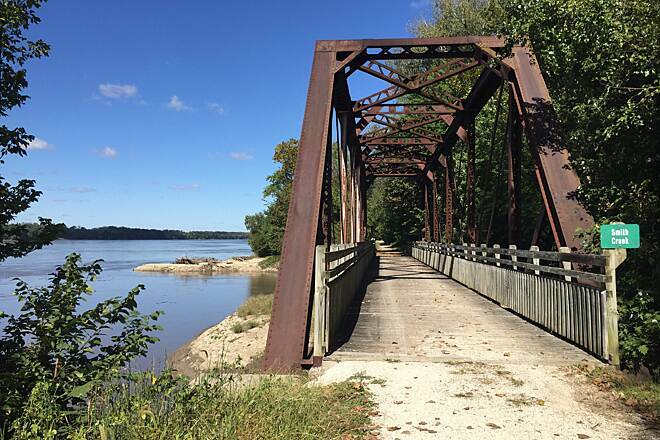 At North Jefferson (mile marker 143.2), riders can take the Katy Trail Spur into Jefferson City, Missouri’s capital, via a three-story bicycle ramp and a protected bike lane on the bridge over the Missouri River. From here, open fields alongside the trail give way to trees shading the path and scenic bridges transporting riders across numerous waterways. 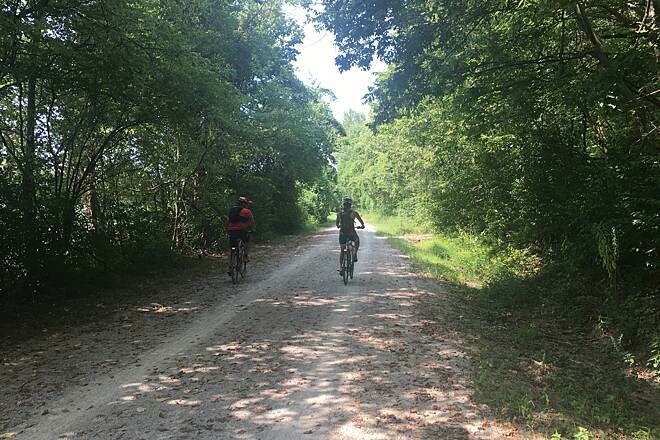 Just west of McBaine (mile marker 169.5), riders can branch off toward Columbia on the MKT Nature and Fitness Trail, a popular 9.3-mile urban getaway featuring a mountain bike skills course near its midpoint. 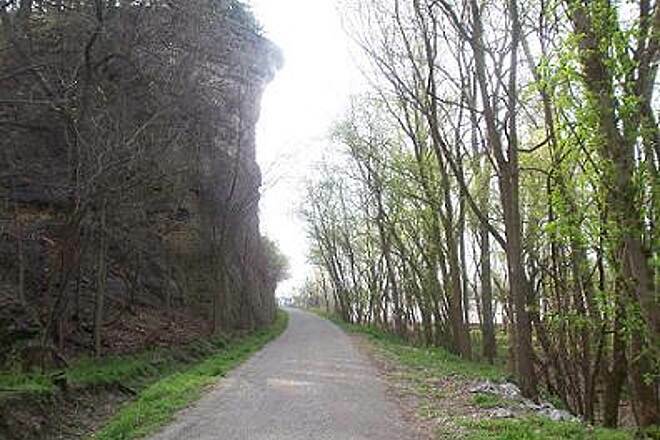 As the Katy Trail carries on toward Rocheport (mile marker 178.3), trail users pass towering bluffs carved by the Missouri River and approach the trail’s only tunnel, cut through solid rock. 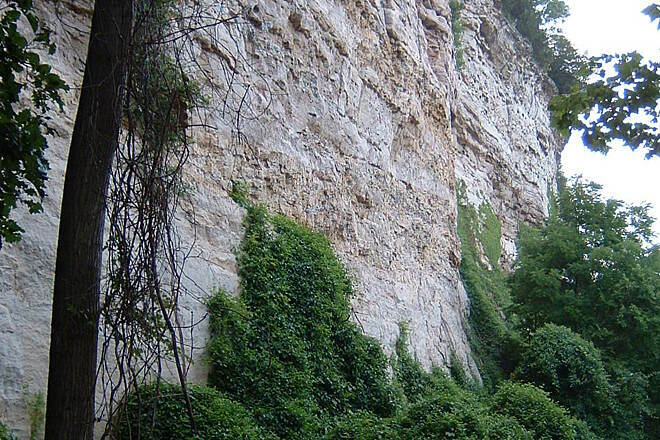 During their famous Corps of Discovery expedition, Meriwether Lewis and William Clark wrote about “curious paintings” left by Native Americans on the projection of limestone here. 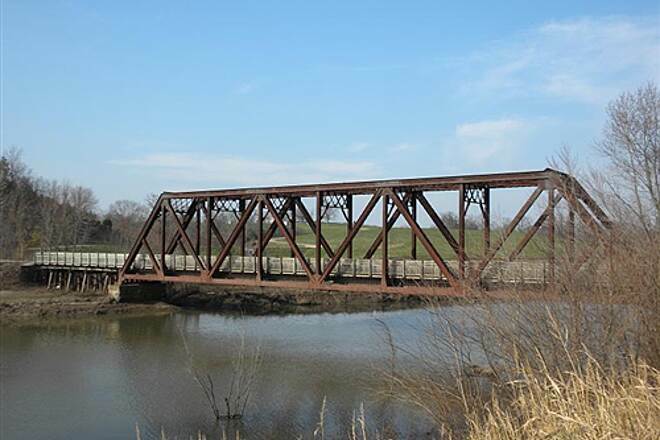 In Boonville (mile marker 191.8), riders may wish to check on the restoration progress of the original MKT rail bridge. 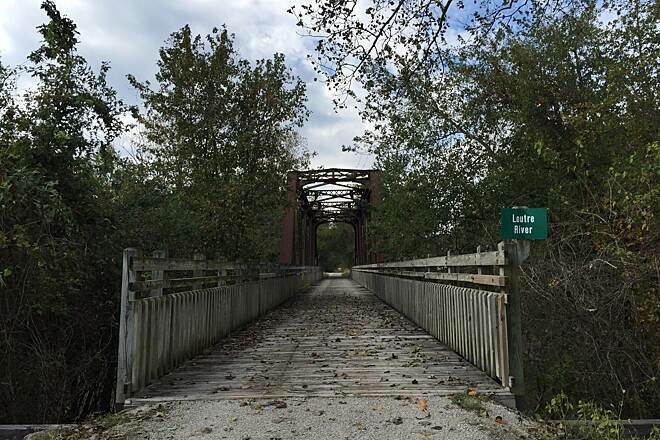 Although Katy Trail traffic currently routes over the adjacent US 40 bridge, the preservation of the original MKT rail bridge serves a critical role in keeping the Katy Trail’s railbanked corridor legally intact. 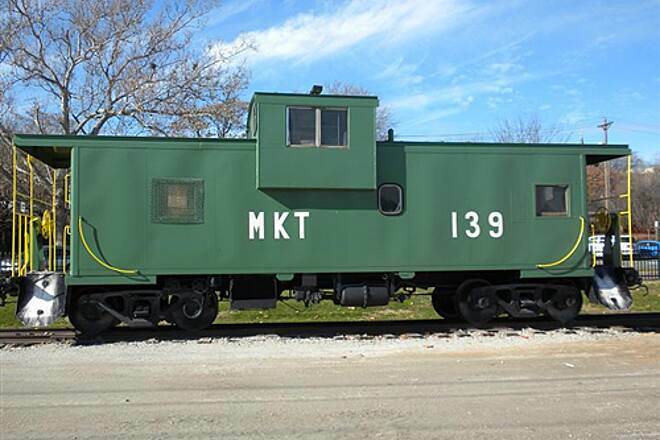 At this point, the trail crosses and deviates from the Missouri River to head southwest toward Sedalia (mile marker 229), home to a fully restored trailside depot that offers a wide range of Katy Trail memorabilia for sale. 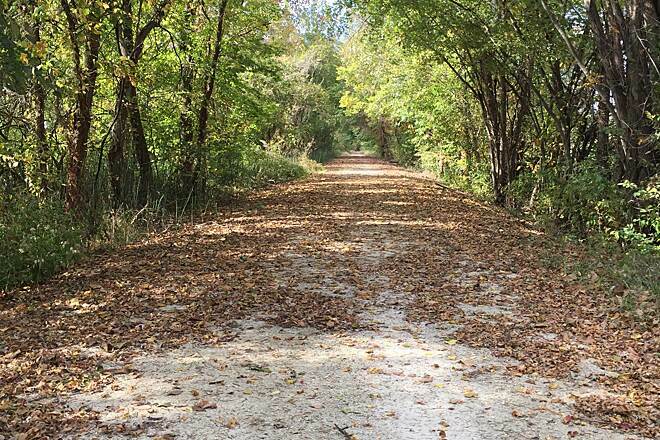 At Windsor (mile marker 248), trail users will want to check out the new Rock Island Spur of Katy Trail State Park, which stretches nearly 50 miles to Pleasant Hill, a suburb of Kansas City. 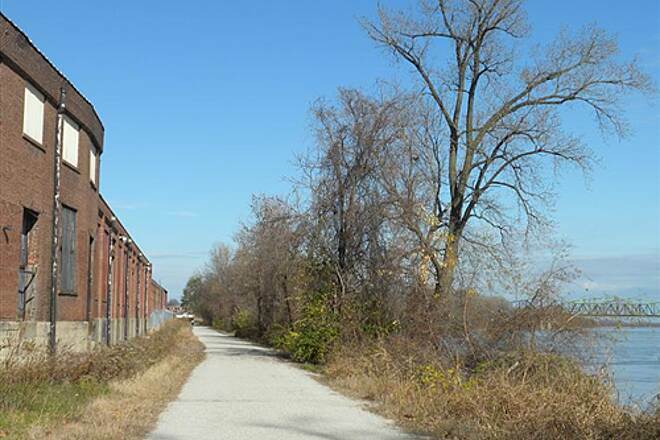 Eventually, more rail-trail will be developed through the Rock Island corridor heading east to connect with the Katy a second time near Washington. 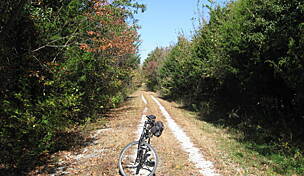 Equestrians can ride between Sedalia and Clinton (mile marker 264.6), the western terminus of the Katy Trail, as well as a section in the middle between Portland and Tebbetts. Directions to Katy Trail trailheads are outlined below. Black Walnut Road trailhead: from I-70, take Exit 228 onto MO 94/First Capitol Drive. Turn northwest onto MO 94 (toward downtown St. Charles) and follow signs for MO 94 for 7.2 miles. At intersection with MO H, continue straight on MO H for an additional 4.8 miles. At the intersection with Music Ferry Road, turn right onto Music Ferry Road. The Black Walnut trailhead and parking lot will be on your right in 0.1 mile at the intersection of Music Ferry Road and Black Walnut Road. 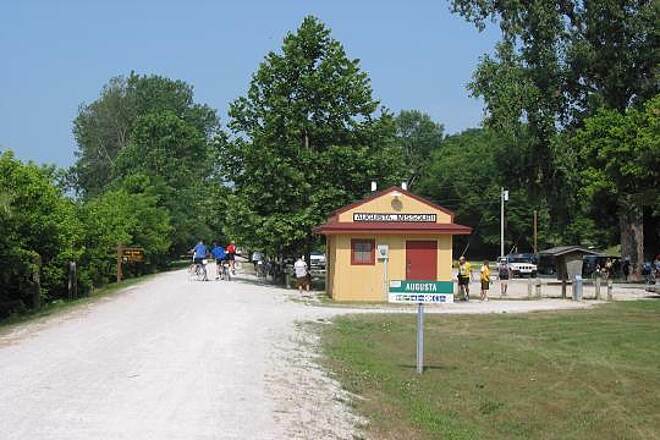 The Machens trailhead is inaccessible by car, but trail users can reach it by traveling along the Katy Trail by bike or foot 2.1 miles northeast of the Black Walnut trailhead (across the street and heading away from Black Walnut Road). Greens Bottom Road Trailhead: From MO-94, turn south onto Jungs Station Road. Turn east (right) onto Greens Bottom Road. Weldon Spring Trailhead: From MO-94, follow highway sign and turn south to trail head. 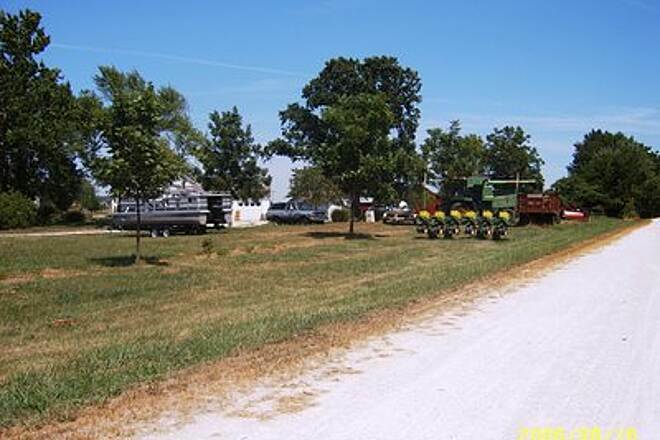 Defiance parking lot: The lot is immediately southeast of MO-94 in the community of Defiance. 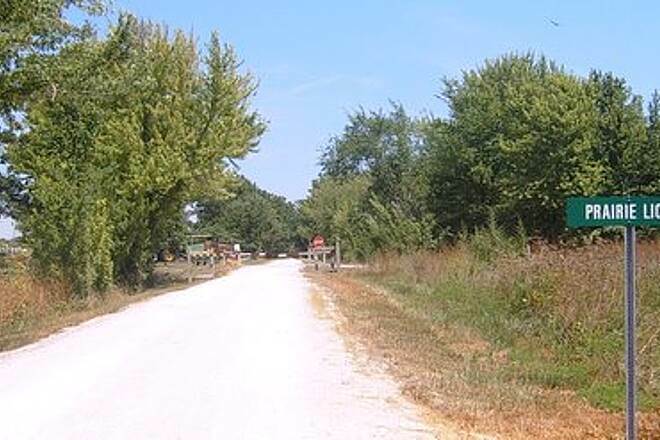 Matson Trailhead: The trailhead is immediately west of MO-94 in the community of Matson. 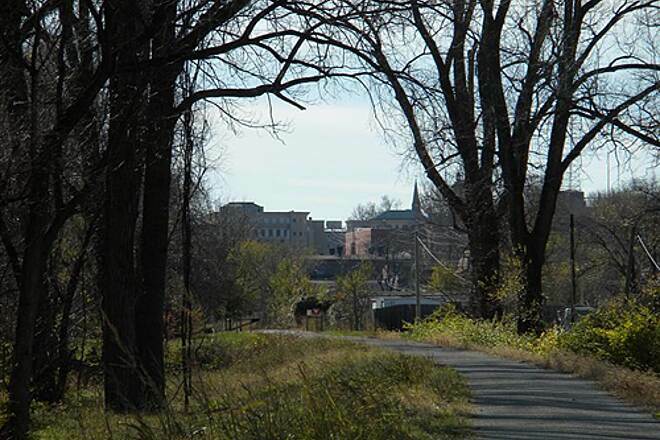 Augusta Trailhead: From MO-94, turn south onto Jackson St. Turn east (left) onto Main St. Turn south (right) onto Public St.
Dutzow Trailhead: From Hwy. 47, turn northeast onto MO-94. From MO-94, turn northwest (left) into trail head immediately south of community of Dutzow. Marthasville Trailhead: From Hwy. 47/MO-94, turn north onto First St. Turn west (left) onto Depot St.
Treloar Trailhead: From MO-94, turn north onto Koch Creek Rd./Rt. N.
McKittrick Trailhead: From MO-94, turn north onto Hwy. 19. Turn east (right) onto Main St. Turn south (right) onto Sterling St.
Portland Trailhead: From MO-94, turn south onto Market Street. Mokane Trailhead: From MO-94, turn north onto Route C.
Tebbetts Trailhead: From MO-94, turn north onto County Road 485. N. Jefferson Trailhead: From Highway 54, turn west onto Rt. W/Cedar City Dr. Turn north (right) onto Oilwell Road. Turn east (right) onto Katy Road. Hartsburg Trailhead: From Highway 63, turn southwest onto Route A.
McBaine Trailhead: From Highway 63, turn west onto Hwy. 163. Turn south (left) onto Route K.
Rocheport Trailhead: From I-70, take exit 115 to Route BB, to Rocheport. Turn south (left) onto Pike St. Turn east (left) onto First Street. New Franklin Trailhead: From Highway 40, turn north onto Highway 5. Turn east (right) onto E. Mokane Street. Turn south (right) onto Howard Street. Boonville Trailhead: From Highway 5, turn south west onto Spring Street. Turn lsouth (left) onto 1st Street. 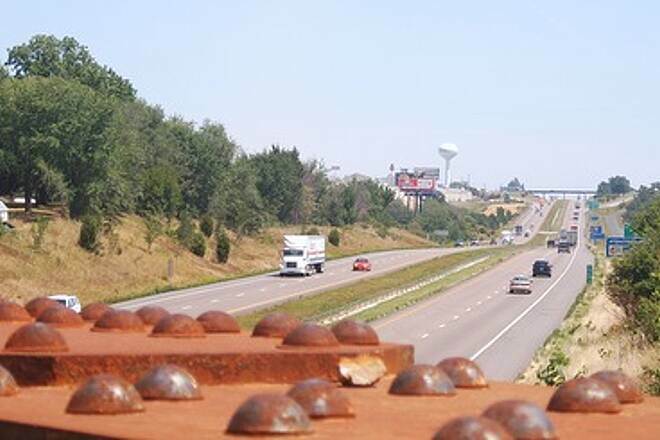 Pilot Grove Trailhead: From I-70, take Exit 98 for Highway 135 South, towards Pilot Grove. Turn west (right) onto Roe Street. Turn north (right) onto Main Street. Clifton City Trailhead: From Highway 135, turn onto Route BB. Sedalia Trailhead: From Highway 50, turn north onto Engineer Avenue. Turn east (right) onto E. 3rd Street. Sedalia Fairgrounds parking area: From Highway 50, turn onto Highway 65 S. Turn west (right) onto Route Y. Turn south (left) onto Clarendon Road. Green Ridge Trailhead: From Highway 65 S, turn west onto Route B. Turn south onto Highway 127. Windsor Trailhead: From Highway 65 S, turn west onto Highway 52. Turn north (right) onto Route 2. Calhoun Trailhead: From Highway 52, turn north onto Olive Street. Clinton Trailhead: From I-49, take Exit 141 onto MO 18 E. Follow MO 18 E for 31.2 miles, and then turn left onto NW 401 Road. Follow NW 401 Road for 1 mile, and turn right to stay on NW 401 Road for an additional 0.1 mile before it intersects with MO 7 S. Follow MO 7 S for 3.8 miles; then take the exit for MO 52 W for 0.2 mile. At the intersection with Price Lane, turn left; then take an immediate right into the parking lot. The Clinton trailhead will be on your right. Un-FREAKIN’-Believable! The review could end here. Buy “The Complete Katy Trail Guidebook” by Brett Dufur. I only had two days to ride to make the best of the eastern half. I will return to ride the western half and the Bluffton and McKittrick/Herman sections I missed. 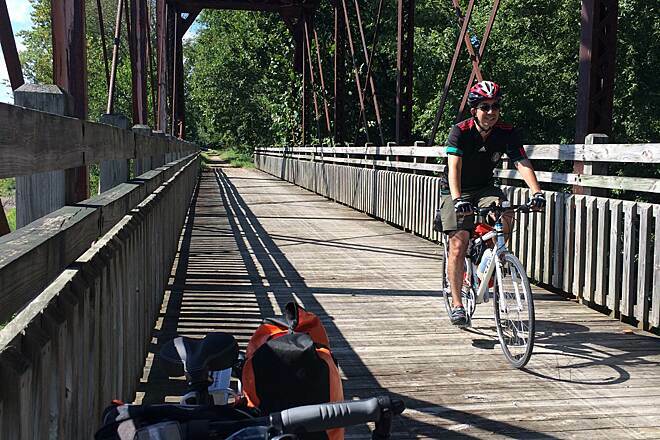 Day 1 - I rode from Columbia to Portland (ride the M-K-T, visit the MLK Memorial Gardens, stop at the iron bridges, enjoy the bluffs, creeks & river, linger at Cooper’s Landing & eat at Dotty’s Cafe). Day 2 - I rode from Trelor to St. Charles (talk to folks at Turner KT Shelter, drink a beverage at Augusta & enjoy the well-earned bounty of St. Charles). Rented our bikes from Touring Cyclist. The bikes had pannier racks ready for us to load up. We were picked up from the airport and taken to their shop to get fitted for our bikes. They shuttled us from St. Charles to Clinton on Day two and picked us up when we finished in St. Charles. We biked St. Charles to Machen on Day 1. The bikes were perfect for the trail. My cycling friend and I had an amazingly good time biking the 237.7 miles of this trail. The scenery changes were great. The towns along the way had perfect accommodations for us. At some of the Trail Heads there are self repair bike stations. We stopped at every trail head and read the information provided. Took a couple of added detours/stops we would not have known about if it had not been for all the information the trail heads provide. Although you have to add a few miles to get into some towns with accommodations and food, the pathways across the river, etc. provided easy access without automobile traffic. Many kudos for those who take care of the trail. It is truly a memorable trail ride and the longest I've ever ridden. Love, love, loved it. We rode this one from the Clinton trailhead for about 5 miles. It was a fun ride on a nice, flat trail. At this trailhead, there were restrooms, water, a bike stand, tools, and even a hand air pump. 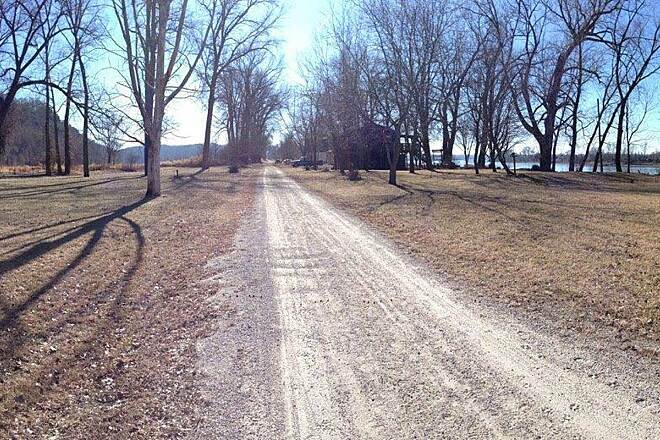 My husband and I stayed in Hartsburg, MO Centrally located along the KATY Trail. We rode out & back loops starting at various depots/trailheads for 5 days. Because of this, we did the mileage of the trail but did not actually cover the entire KATY trail. 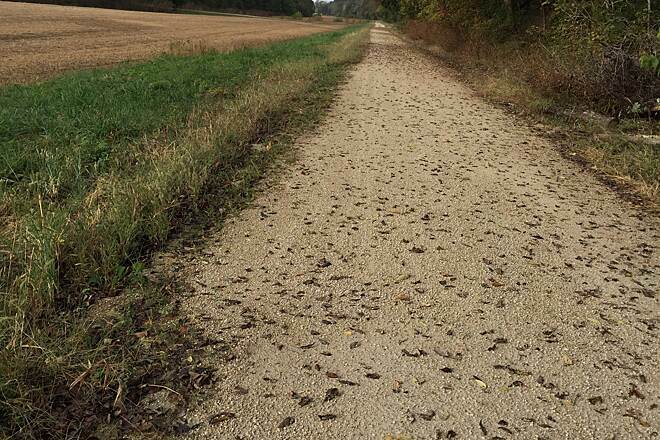 We traveled on the wide crushed gravel trail on the area from Sedalia to Marthasville, only experiencing a few rough areas from wash outs between Hartsburg and Tebbetts just after leaving the Hartsburg trailhead. The trail was in great shape otherwise! This would be a great trail for a family with children to enjoy. The week began with temperatures in the 90s and then cooled down for the rest of the week into the low 80’s which made riding more enjoyable. Saturday- Rode from Hartsburg To Roeche Port -52 miles With the Missouri River on one side and beautiful rock bluffs on the other side. HOT day!!! in the 90’s Lot’s of folks were on the trail. Sunday- was a day of rest (thankfully). We took the afternoon to tour & taste at 3 of the local wineries in Hermann. Monday-Rode from Roeche Port to Pilot Grove-52 miles We had some gentle ups and downs. Passed through New Franklin (the Santa Fe Trail originally started there) and Booneville (named after Daniel because he lived in the area at one time) Lots of history following the Lewis and Clark trail. 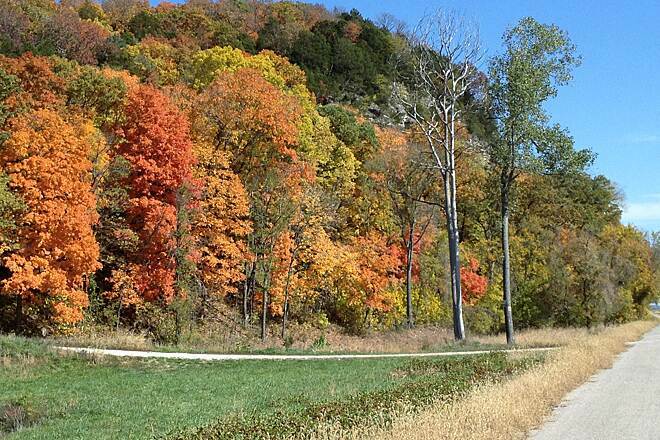 Tuesday-Drove to Pilot Grove to begin our ride. Got there and began unloading bikes and realized that we forgot our lunches (rental house 1 hour away) SOOOOO we drove to Walmart to pick up items for lunch (only 20 minutes away) So we got a late start on the trail…I had shoulder cramps. Just went to mile marker 224(almost to Sedalia)- 42 miles. I had on my UT biking shirt. Passed someone one on the trail from Tellico, TN. Got a “GO VOLS “greeting from him!! Wednesday-Rode Marthasville to McKittrick-46 miles. This was my FAVORITE section of the Katy Trail. The trail was close the Missouri River and part of the Lewis and Clark Historic Trail. We passed a large middle school group of kids. They were doing 25 mile sections of the KATY trail each day. 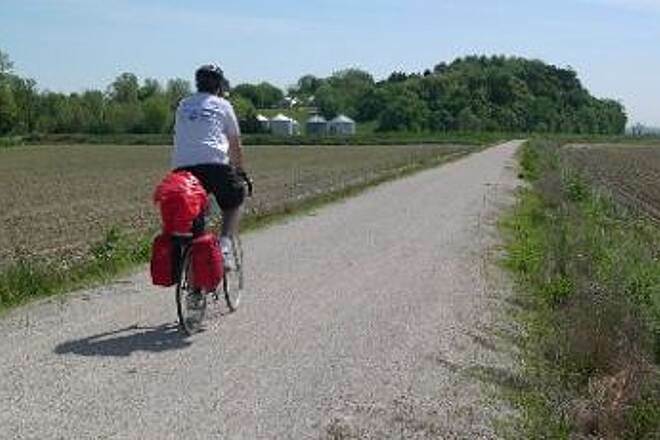 Thursday-Rode from Tebbetts to Hartsburg-46 miles Lots of people on the trail today. Rode through farmland and North Jefferson City, MO Making our total mileage 238 miles!! P.S. Don’t forget to bring your bug spray, the mosquitos can be quite aggressive! Trail was nicely marked miles wise I felt like the trail was under serviced there were many business that were not open that I planned on using. Hats off to the people that maintain the trail it was in good shape. Trail was comparable to the GAP trail between Pittsburgh PA and Cumberland MD just less service areas. The newly remodeled Katfish Katy's in Columbia MO was a nice oasis right on the trail good food. I planned this 190-mi bike trip last fall/spring to coincide w/Cards vs. Braves games 5-7 Aug that my wife & I were going to attend. I drove in from Raleigh; my Bro, Al flew in from Houston on Monday 1 Aug to St Charles Mo. 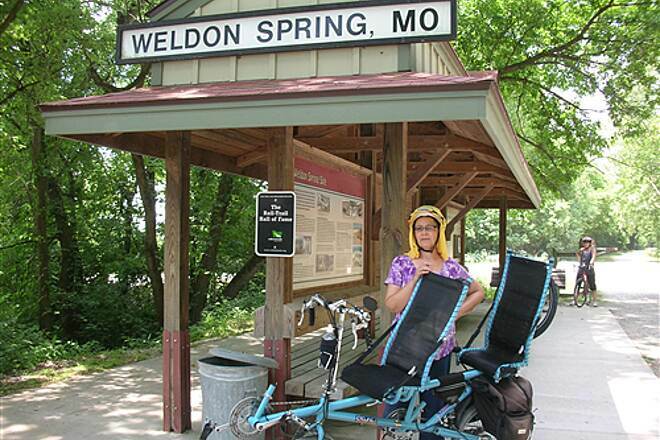 On Tues 2 Aug, we rode Amtrak w/our bikes to Sedalia. We began our ride on Tues @ 130PM and rode 50 mi to Rocheport. On Wed we rode 78 mi to McKittrick. On Thurs we rode 61 mi to St Charles! Despite some recent flooding which accounted for a few rough/boggy spots, the KATY trail was OUTSTANDING! The 3-day ride was HOT & grueling, because neither of us had ever ridden w/panniers, and because ice was in short supply. Thank God, the trail is about 75% shaded! I would equate this experience to our G/Canyon Rim-to-Rim hiking experience last October! The people were FRIENDLY; the views of the BIG MO River were AWESOME & INSPIRED us along, as if we had been floating on the raft w/Huck Finn! Months of planning, and all the reservations required were very much worth the effort! The only change, I would make is leave the Amtrak ride for Day3; not Day1. I live in Cincinnati but have driven out to Missouri 2x to ride the Katy. 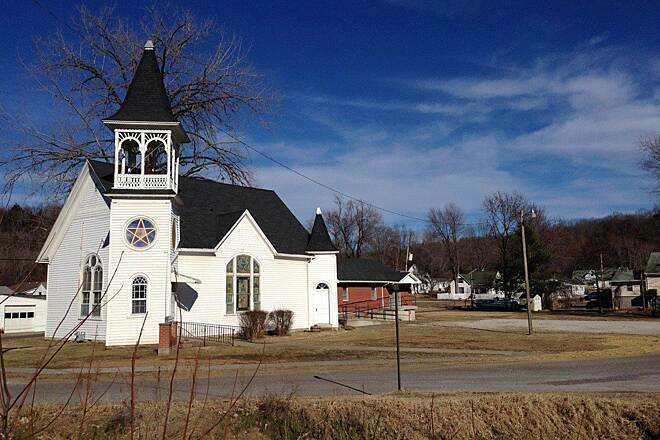 First, last November, drove to St. Louis, parked at the secure Amtrak lot, rode the train and took my bike to Sedalia. The conductor just stood there and told me to hurry up and get my bike on board and get situated--didn't lift a finger, but I got on and really enjoyed the ride to Sedalia. Got off, rode to the Hotel Bothwell (highly recommended) four blocks away, and took off at 10 AM for Rocheport. It was sunny and cold (35 degrees but eventually hit 55)--some small trees and branches blocked a couple of spots from a storm the day before, but cleared them off, explored Boonville, and ended the day in Rocheport--beautiful spot. Ate dinner at Abigail's--wonderful place. Rode from there 80 miles to McKittrick the next day--stayed at Joey's Birdhouse--very nice B+B. Rode over to Hermann, and took a day off to take the train down to Washington, MO and explored that area before heading back to St. Louis. In two days of intense riding only saw 1 other person riding, and a few walking. 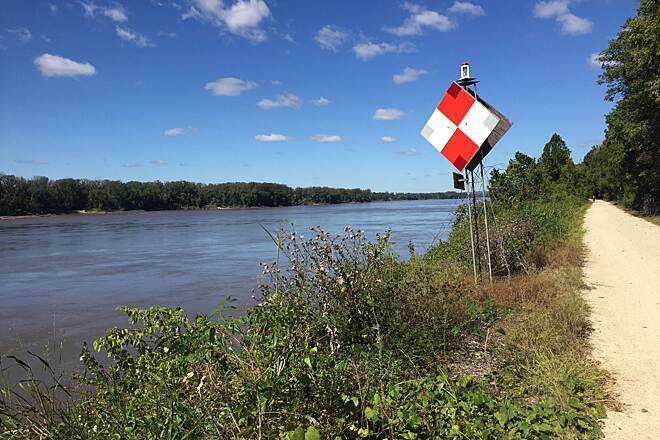 The stretch east of Rocheport is beautiful and loaded with historical information about Lewis & Clark. Trail was in good shape, though with lots of leaves down you have to watch for the occasional gopher hole or erosion in a few places. Overall, the trail is maintained really, really well. I went back in March--week before Easter--with my wife. We took shorter rides--Boonville (really nice town, great hotel--Hotel Frederick) 1/2 way to Clinton and back, and from there over to Clinton and back. I took the train and my bike and went to Hermann where I waited out a storm before riding the Herman to Machens leg (about 80 miles). I love Herman. Great Wurst Haus near the train station. The only rough spot I ever encountered was 3-4 west of Machens, where as a sign warned, the trail had pretty much been washed away over the winter. It was muddy and with Big Ben Schwalbe tires, I was still able to get through and finish out the whole trail. I really enjoy riding this one off-season. You really have to plan ahead--what if a tire blows or you have a mechanical issue? You need to be prepared and as someone else noted, on November 1 the water is shut off at the trail heads, so you need to plan for it. There aren't many places to stay in the winter, and some of them are pretty spendy, so I would factor that in too. Having Amtrak to take you and your bike for an extra $10 (despite the occasional cranky conductor), is a huge plus too if you're going to St. Louis, Washington, Herman, Jeff City, or Sedalia. I love the Katy. The trail surface is excellent overall. The topography is really interesting and varied. The Missouri River valley and the towns are beautiful and calm. If you could only down a portion of it, I'd go from Sedalia to Boonville, on to Rocheport and on to McKittrick/Herman. I would go so far as to rate it slightly ahead of the Elroy Sparta Trail in WI--which is hard to beat--but is about 15% as long as the Katy. All in all, you can't beat it, especially in the spring and fall months. -. 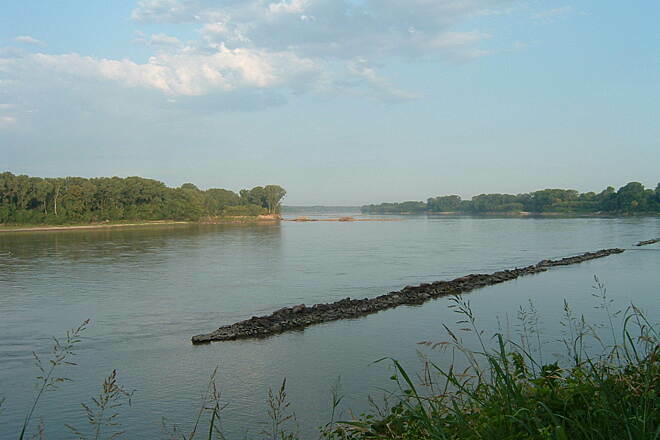 This section of the trail offers two excellent vistas of the Missouri River: one north of McBaine and one south of it. -. Lots of lightning bugs (a.k.a. fireflies) along this section of trail at this time of year, along with tiny toads (be careful to avoid) and the inevitable mosquitos. -. A section near Cooper's Landing, roughly MM 164, is also home to BoatHenge, a small green space with a row of maybe six boats buried standing up, with roughly two-thirds of their length visible. If you're a fan of the "Weird USA" book series, this would be worth a photo. promise a reopening in fall 2016. 163 is currently closed, due to bridge repairs. Try Discovery Boulevard -> Egan Road -> Rock Quarry Road -> 163 -> K instead. a 45 degree angle. Unless you're into playing Frogger or a Mizzou student who doesn't have wheels, I'd really consider driving to McBaine instead. This was my first bike trail ride of 237 miles! My brother-n-law and I rode this trail and it was a great experience. A couple of days, we saw 100 degree weather (June 2016) but it was still fun! The stops and the people we met along the way was priceless!!!! I recommend this trail to everyone. Last year I met my cousins in May at Clinton, MO and started our first long distance ride. It was a blast, even though there was some rain to deal with. We went back in October to travel the stretch we missed the first time. We are meeting again in May of this year to ride it again. A must for your bucket list! My friend and I have rode sections and the entire trail. Every time there are new experiences and the beautiful countryside never gets old. Took some photos on one of our 4 day rides. Check it out! Started 28 October 2015 at St. Charles, Missouri. Total Miles 233.71 - Trail Miles 226 - From mile post 39, north of Frontier Park at St. Charles to mile post 264 + at Clinton, Missouri. The trail is set up for bike riders, the water is shut off on Nov 1st at the trail heads. So if walking the trail, you need to have plenty of water. Some small amounts of food, long distance some days, some days you will see no one. Trail is safe! 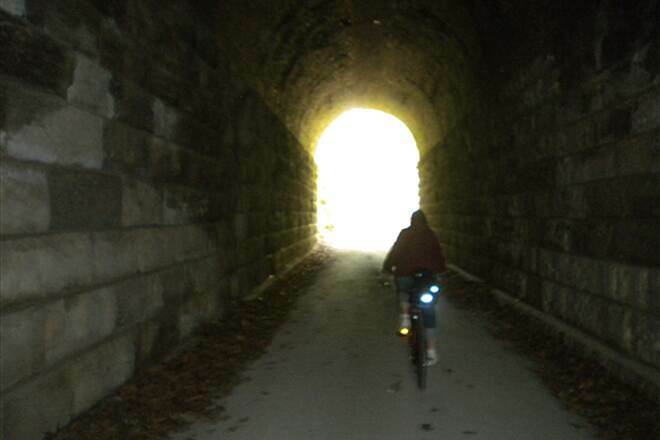 We rode this trail from St. Charles to Rocheport in mid-October. Well-maintained trail, wonderful info kiosks at each trailhead, interesting history (Lewis and Clark especially) and great fall colors. This is what all rails to trails should be like. It is not for hammerheads - the surface is a bit soft sometimes - but a very enjoyable route for a leisurely tour. 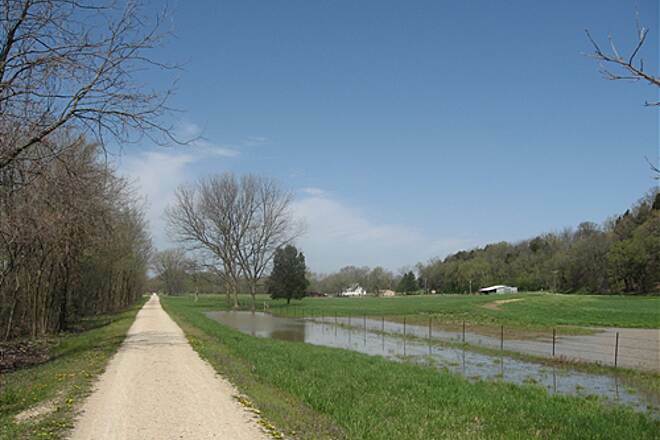 The trail follows the river off and on with stretches thru the floodplain farmland. I wish I had read the Lewis and Clark Corps of Discovery journals before riding this trail. It would have made the frequent historical markers even more interesting. We really liked both towns at either end of our ride - Saint Charles and Rocheport. 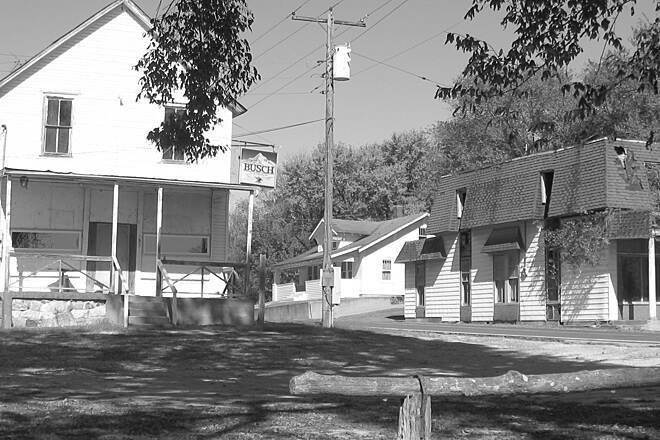 Do not miss the Rocheport General Store. It is a café rather than a store now. Friendly folks, good food, and just plain fun. AMTRAK now has roll on roll off (no boxing your bike) on its River Runner route that parallels the Katy trail on the other side of the river. 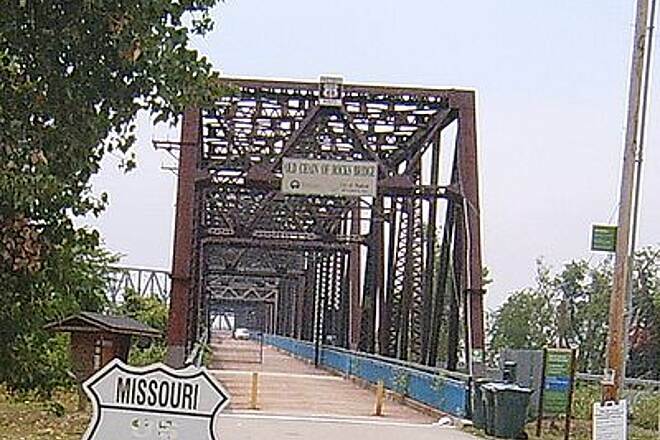 Be aware that some of the bridges across the MO River are NOT bike friendly though. 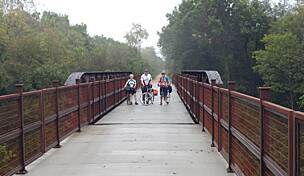 Check the Katy Trail website for info when planning a Katy trip. It is a great source of info for all things Katy related - lodging, camping, eating, drinking, points of interest, AMTRAK details, etc. October was a great time to ride it, no crowds, nice fall colors, not too hot (even though it was an unseasonably warm October week - 85 a day or two). We rode from Jefferson City to Hartsburg. A very enjoyable 10 mile (one way ride). We had a good hamburger at Dottie's Cafe in Hartsburg and got a special tour of the General store on the trail. We only rode about 10 miles starting in St Charles and returning. It was enough to whet the appetite to return and go a few days. The part we rode on was level and not at all difficult for my cruiser. The day was cool and perfect for riding. We ate at the Bike Stop Cafe before our ride. It's a very nice place to eat and have bike checks. They also rent good bikes. We loved this trail! It's well-maintained. There are plenty of restrooms and lots of shade to ride in. We enjoyed the conversations with other riders we met at the rest stops and met people as far away as Canada. It is not a hard trail to ride. There are plenty of chances to stop and read history facts. The folks who maintain this trail do a fantastic job. 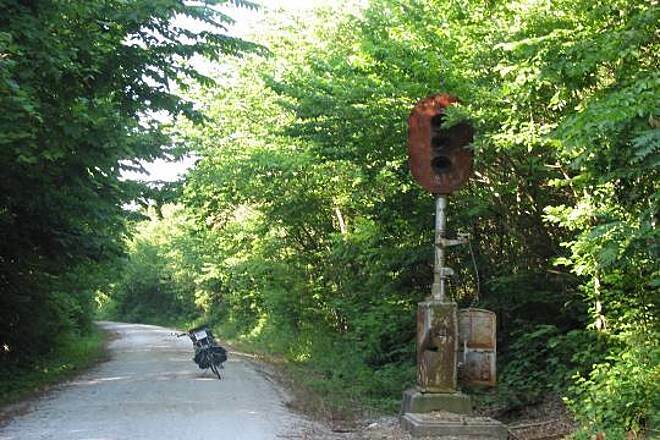 Rough spot signs warn bikers to be on the look-out. We had no complaints, it was a fantastic ride and I'd do it again in a heartbeat! Thanks to you fine folks who maintain this trail. You do a great job! I am from Colorado. I enjoy biking as a means of transportation and ride about 10 miles a day in the summer. I hate riding in car traffic so the bike/hike only Katy trail appealed to me. My family drove 13 hours to Sedalia stayed at the Best Western and left our car at the Depot for the trip. Day1 was Sedalia to Boonville. Beautiful weather that day We stayed at the Isle of Capri which allowed us to bring our 4 bikes into our room. Day 2 was Boonville to Jefferson City. We got soaked this day which made for slow going on our longest day. Stopped to dry off in Rocheport and Hartsburg. Loved the pedestrian bridge into the capital city. Stayed at the Baymont Inn and was so glad they had laundry. Our stuff was mud coated. J&D bike shop trued my wheels, replaced some broken spokes, and installed a much needed computer so I could gauge my pace better. Day 3 was Jefferson City to Rhineland. Another soggy day that eventually dried up. Stayed at the Loutre Lane B&B. Very nice and Lucy cooked a super breakfast. Also the Trailside Café had an awesome buffet that night. Broasted chicken, german potatoe salad, and rhubarb pie! Day 4 was Rhineland to McKittrick. Short ride because we wanted to hit the Maifest in Hermann. We stayed at the McKittrick Mercantile. Joey made a super breakfast that included some veggies from her garden. Day 5 was McKittrick to Weldon Springs. It was supposed to be another rainy day but turned out to be beautiful. Stayed at the Wingate by Wyndham. Super handy to the trail and a nice hotel. Only bummer was no restaurants nearby so we ordered in. Day 6 was Weldon Springs to St. Charles. A short and enjoyable ride. St. Charles has a super cool downtown. Not to be missed. The St. Charles taxi took us to the train station in Kirkwood. I tried to use the shuttle service through the Bike Stop café. It was a Monday and I was told no one was available. Make sure to prebook because it would have been cheaper than the taxi. Train from Kirkwood back to Sedalia was reasonable and only an additional $10. Just wish someone would have washed the Amtrak windows as it is a very scenic route along the Missouri river back to Sedalia. I would love to do this ride again in the fall. The canopy tree riding on most of the trail was wonderful. 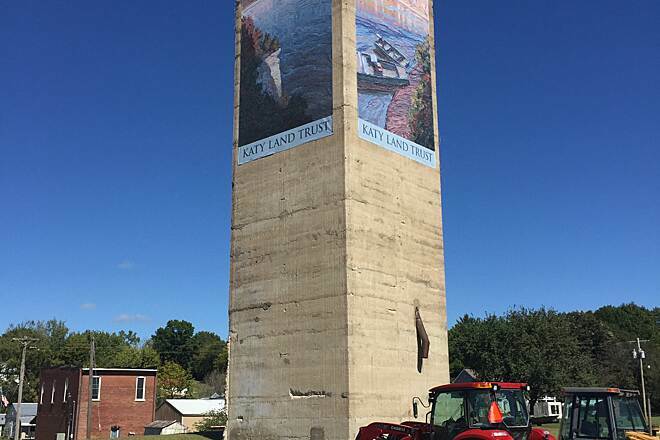 500 miles of KATY – a round-trip in 13 days. This trail is amazing. Nowhere else in the world (that I have found) can you ride 500 miles on a trail – no traffic, very few road crossings, with lots of facilities (like water and toilets) along the way. This state park is an amazing resource. A friend and I decided we would ride the trail, but in order to avoid shuttling by car, we decided to ride it both ways. We planned the trip ourselves, working out mileage per day, where to eat lunch, where to eat dinner, where to stay. Our trip was a bit complicated in that we live in California so we weren’t driving anywhere, we wanted to carry our “stuff”, and we needed to stay in places with 2 beds and we wanted to take the spur trail to Columbia. So…we figured it out and here it is. By day –we made it so that we wouldn’t have to ride 8 hours a day and could stop to read all the information on the Whistle Stops/restored depots and museums with their wealth of information about the towns, history, Lewis and Clark, etc. 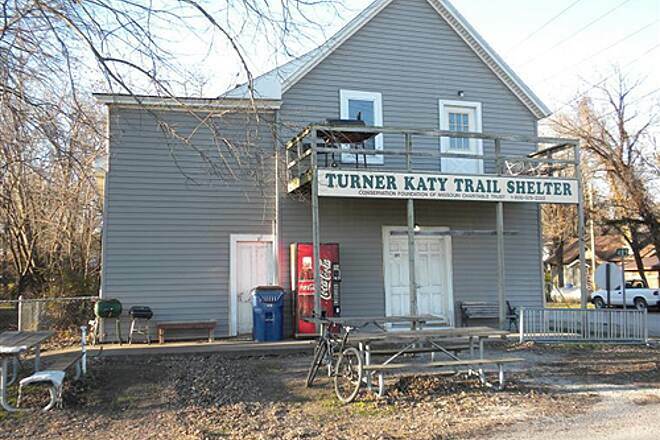 Note that the Katy Trail is a state park that is extremely well maintained with wonderful covered stops about every 10 miles that give the history of the town you are passing as well as what you will see along the way and a number of historical notes. Bathrooms are often provided. If near a bigger town, the toilets are actually flush toilets and have water fountains. If in a more remote, less populated area, the toilets are chemical and no water is provided (to fill water bottles, etc.). 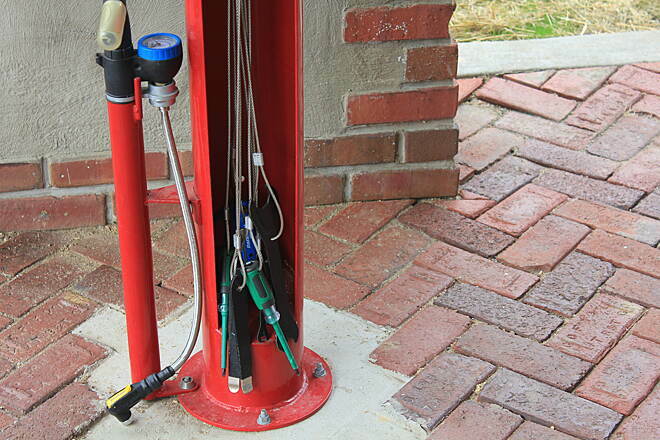 Some stops have bicycle pumps! All are exceptionally clean and a very welcome sight when you see them! We saw a number of park rangers along the way because we were in a stormy time and trees fell down, parts of the trail washed away, but these rangers fixed it all in no time. Really. Felled trees we had to climb over going east to west were gone by the time we went west to east. Amazing. Of course, the parts of the trail that went missing during the last couple of rainy days weren’t fixed yet, but I’ll bet they were fixed within a couple of days. Day 0 (this was our “FLY” day). Arrive in St. Louis, take a taxi to St. Charles ($26.00), stayed at Country Inn and Suites – a really good choice because of the multiple beds and GREAT staff who are very used to bicycles, laundry facilities. Tea/coffee all the time…and cookies! Dinner at Bella Vino (an amazing relatively new restaurant—April is an amazing waitress!). Day 1-45 miles. Defiance to Machens back to St. Charles. Katy Bike rentals (from Defiance) picked us up and drove us to Defiance to outfit our bikes (Great guys there!). We started in Defiance, rode to St. Charles for lunch (Bike Stop Café- EXCELLENT! ), on to Machens and back to St. Charles the first day for a total of about 45 miles. A tough first day, BUT, because we were staying in St. Charles two nights in a row, we didn’t have to ride with our panniers! The scenery isn’t spectacular between St. Charles and Machens – but nice and although it may be seasonal, there were a lot of bugs in the air. We took pride in getting to the “end point”. 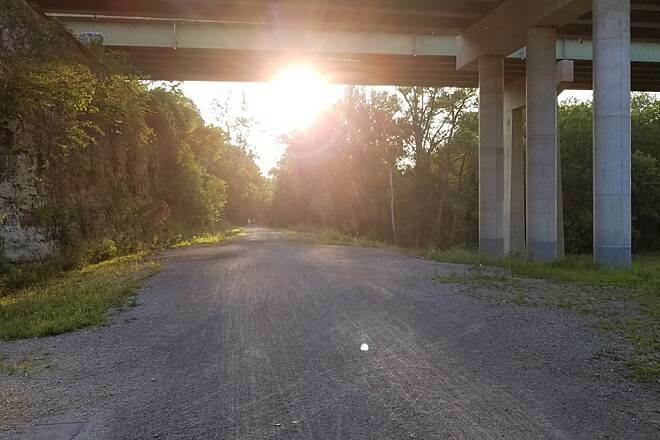 Between St. Charles and Defiance has a bit of city – you go around the arena and ride along the road for a bit – still always riding on the trail but it does skirt the road. Just adds to the variety of the trail! Dinner options in St. Charles are endless! Day 2-26 miles. St. Charles to Augusta through Defiance. Unfortunately a rainy day (but you HAVE to expect that in a 2-week ride in the fall). We were prepared so actually enjoyed it until the thunder and lightning started about an HOUR from Defiance as we made our way back there. We got to the bike shop and waited there with a very pleasant Eric, hot coffee, etc., and waited for a break in the weather – which happened so that we could go on to Augusta where we had lunch at Kate’s Coffee –another amazing restaurant that has popped up on this trail! We stayed at the Stone Ledge Guest Suite above an antique store and had our own apartment (with 2 beds! ), and loved it. Lisa provided us with TONS of appetizers/breakfast foods that actually fed us for that evening (which was stormy), the next morning and LUNCH on the trail! Amazing! Day 3-39 miles. Augusta to Rhineland through Dutzow. If you need lunch there is a great deli in Dutzow which is only a few miles from Defiance – but has a deli and you can pick up food. A GOOD deli! We went on to Rhineland where we stayed at the Doll House B&B which was WONDERFUL! Loved the owners, service and our room and warm cookies, etc. The only place to eat near there is the Trailside Café – which has normal sort of pub food – a lot of fried stuff very reasonably priced. AND beer at happy hour is only $1.00! Breakfast at the Doll House is an experience not to be missed. Day 4-49 miles. Rhineland to Hartsburg through Mokane. Lunch in Mokane (at the bar and grill that has GOOD chili! ), night in Hartsburg where we stayed at the Globe Hotel with wonderful Jeannette and her 11 cats (mostly outside) and ate at the magnificent Grand Restaurant right next door! It was a GREAT stop! Day 5-38 miles. 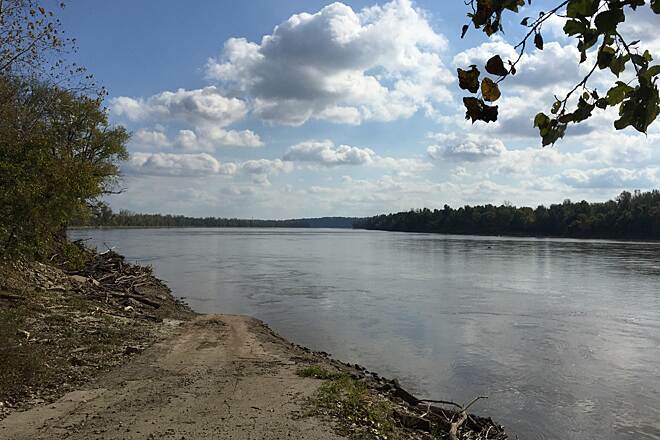 Hartsburg to Booneville through Rocheport. Went to Rocheport for lunch and ate at the Mulberry Grill and Bakery which is neither a grill nor a bakery – it’s a pizza place with an outdoor oven and is actually good! On to Booneville for the night. Two things about Booneville – one is the Hotel Frederick which is a funky period hotel and worth staying in! There is also a casino that has a hotel and entertainment that we didn’t know about until we passed it the next morning within an easy walk of our hotel – funny – never read a thing about that casino on any of the websites about the Katy Trail. The other thing is the visitor center – really nice restored depot. The casino would be an option for staying or just entertainment for the evening! We ate at the hotel – the restaurant was closed that night (sorry to say!) but the bar served food and it was great! Really a very scenic part of the trail – lots of what I call Foliage tunnels where the trail is covered by trees and protects you from wind and weather. If it’s raining, it’s actually comfortable in the foliage tunnels! Day 6-38 miles. Booneville to Sedalia though Pilot Grove. Coming into Sedalia is the only part of the trail that is disconnected, but the lanes are well marked and KATY signs abound. The signs lead you to a great museum (restored depot) and a great bike shop. Steve was a marvel fixing all of our little problems. We stopped for lunch at Pilot Grove – it was actually too early to eat so we got sandwiches to go – seriously good sandwiches! In Sedalia, we stayed at the Hotel Bothwell – a wonderfully restored and beautiful hotel. Unfortunately, the restaurant was closed that night sp we ate where everyone else eats – at Fitter’s which is a good pub with lots of beer options (including our favorite: Shock Top Belgian White!). Day 7-51 miles. Sedalia to Clinton and back to Windsor. Just before you get into Windsor (going West), you will cross a road – if you are staying at the Windsor Crossroads motel, it is best to take Windsor Road. That way you avoid having to climb the hill up to the motel from town. Three places to eat – Raymond’s (family restaurant with a lot of fried foods) and a really good place for breakfast, New China (fresh Chinese/American) and Subway. The motel is clean and comfortable and it is a reasonable walk to restaurants, however there are no sidewalks part of the way and no street lights so it was a bit of a challenge after dark. Day 8- 45 miles. Windsor to Pilot Grove through Sedalia. Laundry Facilities. Lunch at Woods grocery store – picked up wonderful, fresh sandwiches and went to eat at the depot which has water, bathrooms and is in a nice spot. Spent the night at Katy Junction B&B where Jerry is a magnificent host. This B&B is right on the trail and across the street from Deon’s – the only place in town to have dinner and actually pretty great! It was a fun place to stop, chat with other bicyclist and some locals as well as the cool bartenders. Super Wednesdays – beer for 75 cents a glass!! Day 9-43 miles. Pilot Grove to Columbia. This was the “should have been” day. Major thunder storms caused us to call a shuttle to take us to Columbia where we toured the Missou campus in raincoats. We stayed and the incredible Gathering Place B&B. Highly recommend this “spur” trail – Columbia is a vibrant, beautiful town although the college kids do tend to get drunk and be noisy until the wee hours. Day 10-18 miles. Columbia to Rocheport. This short day was fun because we got to ride through a lot of puddles. We backtracked a bit on the trail because we wanted to have lunch at the Blufftop Bistro in Rocheport. The bistro has a bike rack at the bottom of a trail leading up to the winery. It’s about 1/3 mile through the woods. Very nice. And it was a superb place to have lunch! Unusual, high quailty food and service. We loved it and hated to leave. We stayed at the Schoolhouse B&B – in the annex – a separate building that had laundry facilities, bike storage, 2 beds, and food stocked for breakfast. We had dinner at Abigail’s (reservations recommended as it is very popular), but found the food to be pretty average – unusual, but average. Day 12-42 miles. Jefferson City to Hermann through Portland. We got up early and decided to ride right through without lunch because we wanted to get to Hermann and the October Fest celebration that was happening. We got a pizza at the Tinmill Brewery and listened to some good music and also went to the Hermannhof Winery where we got wine and more music! We stayed at the River Suites (associated with the Harbor and Nestle Inn – 3 different properties owned and managed by the same people). This was perfect for us – two bedrooms and a shared bath on the upper floor of a house overlooking the river. Even has a washer and dryer. We ate at a modern restaurant called the Black Walnut which was a great find. Day 13-35 miles. 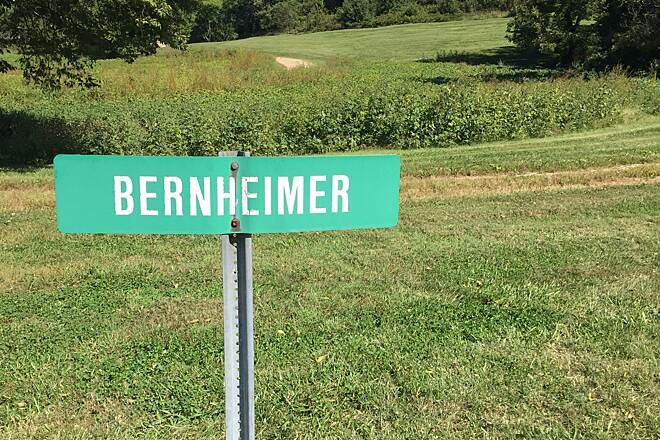 Hermann to Augusta (or Defiance – but we couldn’t get there due to the storms). Another rainy day – this one was the hardest – a strong headwind the entire way, raining like mad and a lot of open, uncovered space, washed out sections of trail, fallen trees here and there. We only made it to Augusta before giving up and calling our Katy Rental Bike saviors – who picked us up but not until after we all had lunch at the magnificent Kate’s Coffee complete with FRESH, WARM blueberry muffins and a giant latte! We simply had to skip that last bit into Defiance – it was ok because Katy Bike Rentals has a shop in Augusta and we were able to leave the bikes there. We were delivered wet and tired to the Country Inn and Suites for a final night. For our celebration, we took a taxi to Prasino – a great restaurant but not possible to walk there from the historic section. It cost $6.00 for the taxi – the restaurant called us a taxi when it was time to go back. We had magnificent salads, a dragon roll, wine and a pumpkin beer for dessert! We live near terminus at Clinton! We ride the KATY regular on the western end. We have ridden the entire trail at least 7 times. We have ridden many trails and this one is the best (ok I know it's our neighborhood trail). Get out and enjoy. The hardest part is if you are a through rider is getting transportation back to the other end. Enjoy!! My son and I set out to ride the Katy over the 2nd weekend in October, 2014. We began our ride in Clinton with cool temperatures and overcast skies which cleared for a great day of riding. We stopped in Sedalia for lunch, and made our way towards Boonville with a lot of peddling. The segment from Clinton to Boonville is a gradual uphill grade, but not steep at all. After all, it's a converted train route! Just take your time, and enjoy the stops along the way. The rest of the way after Boonville into St. Charles is a gradual decline in grade and loaded with points of interest and scenery. We made our first stop for the evening in Rocheport on the other side of the tunnel, and stopped at the Mulberry bakery & pizza place right along the trail with tasty wood-fired pizzas. Our first day spanned a distance of about 90 miles as we rested for the night at The School House B&B. The next morning on Sunday we woke up to an overcast and misty day, but we rode out the wet trail all the way to McKittrick. Along the way, we met the folks in Hartsburg who were having their annual Fall festival which was fun. Also, we knew that the stop at North Jefferson would not get us close to restaurants, so we stopped in Claysville at the "general store" there which is actually a restaurant in the red colored building. If you can stop here for lunch, do it! They have the best fried chicken dinner you will ever get. The owner is a very welcoming man and appears to cook the meals himself along with the other staff. We then mounted the bikes and headed East to McKittrick which was our second stop for Sunday evening at Joey's B&B after completing 78 miles for the day's ride. Joey took us to the local Loutre Market and we ordered some hot food and took it back to our room. Joey has a real nice and comfortable B&B right off the trail, where you can get a great night's sleep at a reasonable price. The 3rd day, we woke up to thunderstorms and pounding rain, and decided not to pursue the ride into St. Charles but set our sights on the Spring of 2015 to finish out the last 61 miles of this great rails to trails project. A big thanks to "Ted" & Pat Jones as well as the Missouri DNR for funding, building, and maintaining this wonderful trail! I rode the section of the Katy running from St Charles to Jefferson City on a roadbike running 25mm gatorskin tires (~105 miles). It had rained quite a bit in the prior days and the trail was not as hard as other crushed limestone trails I have ridden but this in no way become difficuly to navigate on a roadbike (although some of the turns offs were a little dicey). The biggest suprise to me was when i veered off the Katy on to Hiway 94 for some smooth riding pavement and was hit with several 200+ ft climbs (and quite steep grades) just East of Agusta. Ugh. there are other crushed limestone trails with a similar experience (I&M canal, Hennepin Canal) but I guess for the sheer length of this trail it gets a 4 stars. Also the bike ramp over the river into Jeff City is pretty cool as is the downtown of St Charles. 2 years ago in Oct, a couple of friends and I rode the entire trail from Clinton to St.Charles. We did it over 4.5 days. Got a shuttle from Katy Trail Bike rental ,Defiance MO. They picked us up with all our gear at the St.Charles river front and drove us out to Clinton MO. Stayed in B&B's and Hotels along the way. Trail was in great shape. Fall color was beautiful!! The many adventures along the way such as , a loose cow walking across the trail, being chased by a dog or two, getting caught in a thunderstorm outside of Roche Port and others made this trip a trip of a life time! We still talk and laugh about the great memories we have concerning this trip. Would I do it again? You bet! Enjoyed a great ride starting at GreenRidge on January 20. The trail was fast in the morning when frozen but became soft in afternoon. It was an amazing ride and great workout! Kudo's to the landowners who allow this through their farms, the volunteers, and State Parks personnel for this great trail. Nice flat ride along the river and skirts Jefferson City. Should be better with the turning of the fall leafs. 44 miles ridden with my wife and she also enjoy the scenery. I'd caution about going too late in the season. Repeated freezing with rains makes the trail heave so on warm days it's a 1/2 to 3/4 inch deep mush, very difficult with narrower road tires! I have wider ones but my gal had to stop and wait for me to get the car! Our club has a fall ride on an October Saturday as a group from Defiance to Augusta and back, with a stop at one of several wineries along the way. They have food and decent wine, fairly reasonable. Makes for a laid-back day! 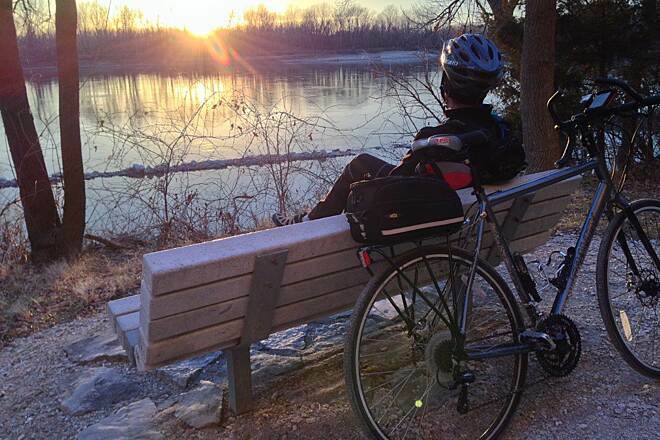 I bow to the Katy Trail and to all of those volunteers, local agencies, and the state of MO. By far the best signage, trail maintenance, and even a section on the state highway map. Well done. We were a group of 3 that decided to ride this trail end to end (almost). Being from California, we used a service to plan the trip (Independent Tourist). It was a fabulous experience. 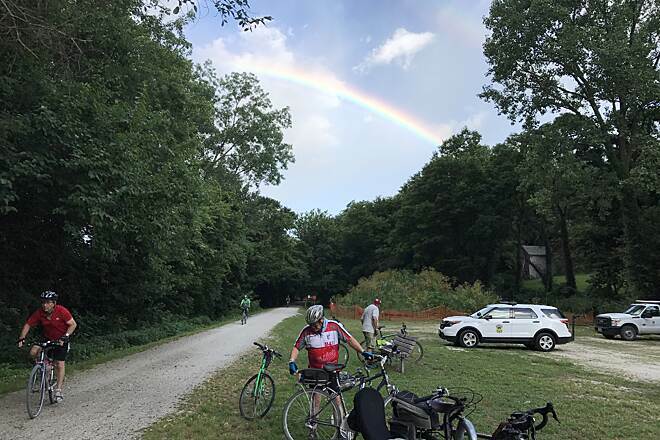 We flew to St. Louis, were shuttled to the Katy Bike Rental shop and then shuttled across Missouri to Clinton for the start of the West to East ride. We rode 30-50 miles per day depending on where we were headed. Since the trail is basically flat, the ride is pretty relaxing. There is a long slightly uphill stretch from Sedalia to Rocheport…no coasting down on that part! Every day, our luggage was moved for us. We stayed in historic hotels and B&Bs. We rode for 6 days on a trail that is, in my opinion, a national treasure. 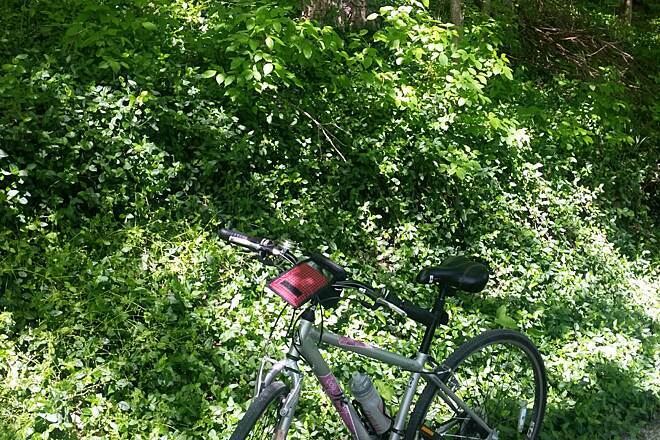 This trail is tightly packed gravel and is an immaculately maintained state park. We rode 225 miles (plus a few to get to and from lodging) and every section of it was clean, well maintained and simply beautiful. Riding through scenic farmland (believe me, it is really, really scenic!) in the fall on a tree shaded trail for a few days was a wonderful experience. Not to mention the charming towns and whistle stops along the way. Many of the towns on or around the trail have populations of less than 200 – all were immaculate and studded with houses and buildings dating from the 1840s. The entire length of the trail is a state park and has historical notes posted along the route (lots of Lewis and Clark, Daniel Boone, etc. sites). 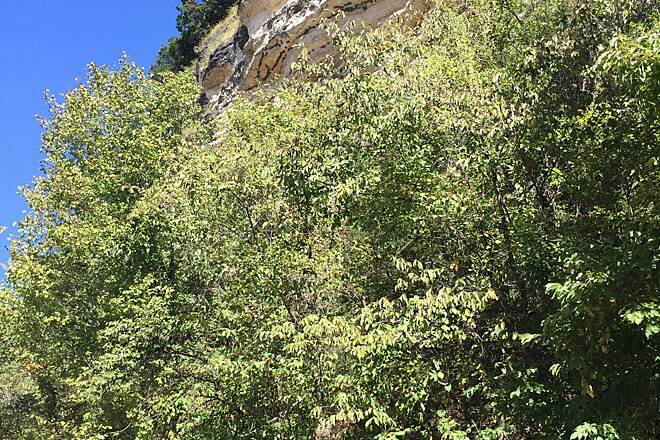 Parts of the trail are along the Missouri River which just adds to the scenery especially on the sections where the towering bluffs where on one side and the river on the other. 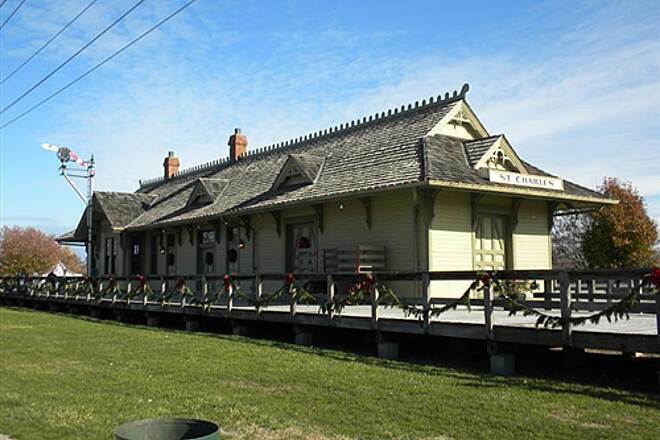 A couple of the old depots have been restored and are now museums – which are a great deal of fun to visit (Booneville and Sedalia). The whistle stops all have signs giving facts about the area and that particular section of the trail. Whistle stops all have clean bathrooms (chemical – but clean!). 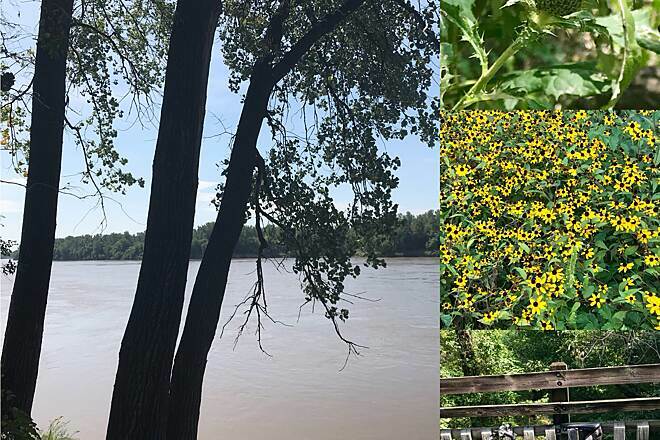 The area around Rocheport is very pretty and the town hosts a couple of restaurants that are the best along the trail (again—in our opinion). Les Bourgeois winery (and restaurant) was the best we found (although difficult to get to). However, our B&B hosts at the Yates House were kind enough to drop us off and pick us up!! (Full blown Missouri courtesy!) Food could be found along the way for lunch every day—amazing pizza can be had at Phillly’s in Marthasville! Highlight towns are definitely Rocheport and Hermann. Hermann has multiple B&Bs and restaurants and is a very German, beautiful town. For a mid-day stop – Taylor’s bake shop in Booneville was a great find! Cappuccino and chocolate cake after 25 or so miles is always great! And St. Charles with its cobblestone streets and walkways, historic buildings and beautiful parks is a wonderful place to begin/end the trail. Highly recommend this trail – how many places in the world can you ride for days without riding on streets? We came from Melbourne, Australia to sample a few cycling rail trails. We brought our tandem recumbent with us. We started from Arena Pkwy just off Page Avenue Extension 364. This is a relatively new car park without shelter or restrooms. 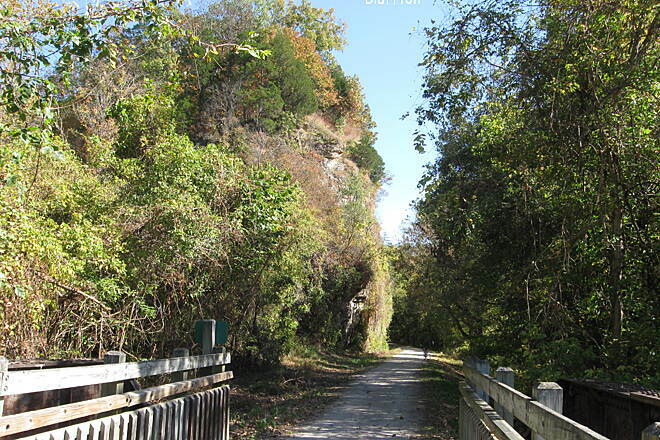 We cycled down a steep ramp onto the Katy Trail towards Weldon Springs. The path is gravel but well maintained. 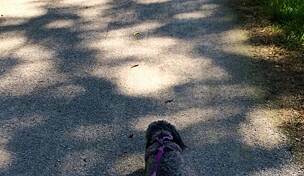 It was a hot and humid May day, but the trail was sheltered in places. The area towards Weldon Springs was green and picturesque. We enjoyed the day's ride very much and recommend this trail (probably one of the longest in the world). We leave the photo for posterity. Awesome ride for all ages and abilities! I have ridden various parts of this trail, from Machens through Augusta. The trail is mostly flat, and I've seen bikes varying from MTBs to road bikes. The compacted limestone makes for an easy ride, except for a few spots, or after a hard rain. 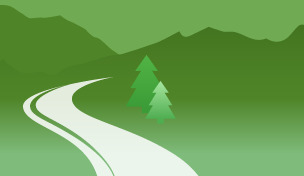 Lots of things to do and see along the way, including side trails, parks, restaurants, shops, bar/grills, and wineries. It's a great way to see the state. We are lucky to have access to this gem. My neighbor and I just rode the Katy trail from Dutzoa, MO to Sedalia, MO. We boarded AmTrak in Sedalia, MO and got off in Washington, MO. then rode our bikes to the trailhead and proceeded back to Sedalia. All in all it was a great ride altho I did have a couple of flats along the way from thorns that were left in the trail from mowing and trimming branches. There were plenty of water stops, rest rooms and places to stop and eat along the way but you needed to take advantage of each place because some of them were a few miles apart. In Boonville, MO, we stayed at Hotel Frederick (http://www.hotelfrederick.com/)and ate at Glenn's Cafe, what a treat that was. Let them know you are riding the Katy Trail and they will take great care of you. On the trail from Boonville, MO to Sedalia, MO you pass through Pilot Grove, MO. Depending on the time you get there, the grocery store across the street may or may not be open, it was closed when we got there. Make sure you fill your water bottles at Pilot Grove because we never found any water at Clifton City and it's a 24 mile ride to Sedalia from Pilot Grove. For me, 3 24oz water bottles wasn't enough, course, having a flat tire 5 miles out of Sedalia didn't help either. Take your camera as there are several photo stops along the way. Would I do it again? Sure, but I think more planning on my part would be helpful. Have ridden the trail from Windsor to Sedalia, this is a good trail but has several inclines and has the highest point on the trail, had to get off the trail in Sedalia to find a place to eat, needed a Garmin to find the place to eat, this trail is a lot of open ground and a good test of your biking abilities, it is well maintained and easy to navigate, the next day we rode a 10-15 mile round trip out of Rocheport, wish we had started here, a wonderful town with several places to eat right off the trail and a bike shop with bikes to rent if you don't have one of your own, Rocheport sports the only railway tunnel on the trail and the scenery there is well worth the trip, the trail has 100 foot cliffs on one side and the Missouri River on the other, be sure to bring a camera and plan extra time to stop to take it all in, we are going back this year during Memorial Day weekend to start at Rocheport, and spend much more time there than we did before. I would suggest this as a model for those who are starting or working on trails. It has really excited my future interest in bicycling and riding the Rails to Trails. I have the good fortune of living less than a block away from the Katy Trail. Unfortunately I do not use the trail due to being disabled by arthritis. If I were younger and enabled I'd be using it almost every day. My wife up until a year ago used to be a part time short order cook at the Mokane Bar and Grill. She always enjoyed talking with the trail users whenever she had the time. Some of her most pleasurable experiences there came from trail users. There was a lot of opposition to the trail in the beginning. I have not heard much bad talk about it lately. I'd like to remind trail users to respect property rights and to always try to be friendly with the locals. Myself if I am driving along and see bikers on the road headed into Mokane I always try to wave at them. The vast majority do not wave back but that is because they are concentrating on the road. Some (very few) have seen me wave only to give me a suspicious look and bike on. Perhaps the theme song from 'Deliverance' was playing in their mind. Some folks give me a perplexed look and then wave back. I like that. I like to remind folks that our way of life out here is different from theirs. I've never met a trail rider I have not liked. The same goes for my wife. At one time I considered buying a small plot of land here and making a campground out of it. Unfortunately businesses that depend on the trail in this area do not stay open for long. That fact and the fact that our town floods frequently caused me to change my mind. 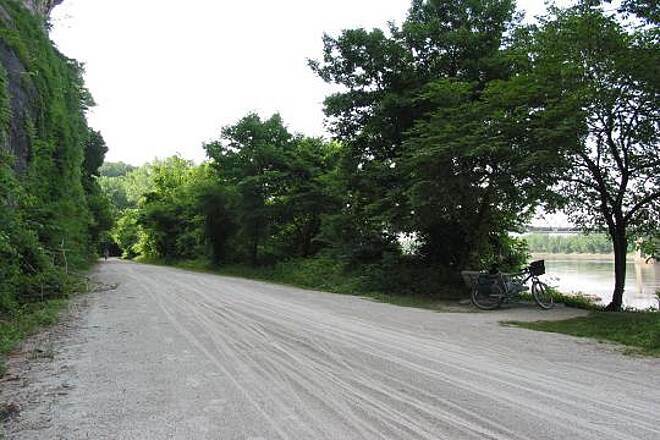 I began riding the Katy Trail in 1997 and have not stopped (well, I may have missed a couple of years in there). 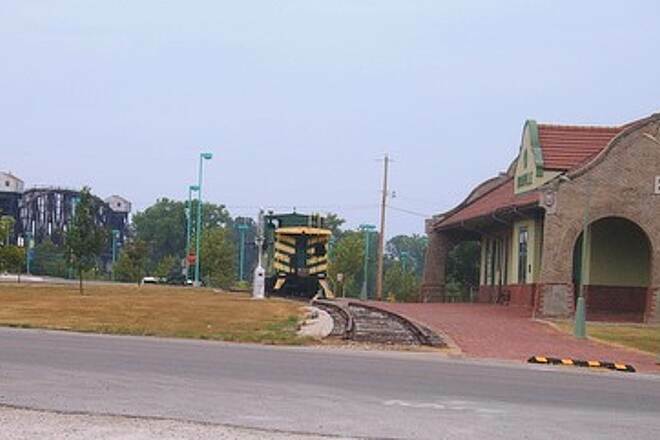 Each year I drive to Sedalia, park my car at the trail head, hop on my bike and spend 3 glorious days riding to the downtown train station in St. Louis. This year, I decided to add a day to the ride and take the MKT into Columbia, MO. Unfortunately, the MKT was undergoing construction so I did not get to fully appreciate that trail. Guess I will have to try it again next year. The fact that I keep going back after 13 years is testimony to how awesome this trail is. 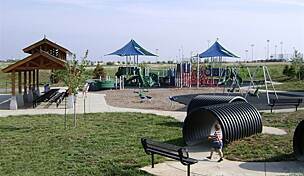 It is beautiful; it is well-maintained (a state park, no less); it is challending and loads of fun. I would recommend this trail to anyone. THE FIRST DAY RODE THE TRAIL EAST FROM FEFFERSON CITY. STOPPED AT A FUN PUB IN TEBBETTS NAMED JIM'S BAR (Jim is the owner and bartender). A large group were there playing spoons, wash boards, tub drums and bases. They came by horseback. The nex day rode West from North Jefferson Trail Head. This direction is more attractive as it has views of the Missouri River. This is the longest uninterupted trail in the US. Small towns dot the trail for easy access to food and hydration. Saw a copper head today it did not bother me and I did not slow down to take a closer look. If one could alot the time and planning necessary the entire trail would be worth the trip. The trail is well marked, safe, in good condition, has abundent shade, and easy to find. Did a round trip of thirty miles out of St. Charles. What a nice day and ride. Seen the most Cardinals ever during the ride. They kept on zig-zaging across the trail. Always in sets, one female and one male. Also, met alot of nice people. "My husband and I and our 19 yr. old son ""did"" the Katy trail in the summer heat, and had a great time. If you are in shape for distance biking, and have a decent bike, it is doable. The trail was awesome; shade from a canopy of trees much of the way, no motorized vehicles, nice friendly places to stop along the way, hard packed gravel that had the feel of a paved road, very few ruts and just an occasional patch of loose gravel. We were thankful we hadn't weighted down with big heavy tires. Our road bikes were fitted with gater skin tires 700X25mm. Hermann Motel was our starting point. Clean, inexpensive accomodations in an awesome little German town. We were able to leave our van there during our ride, and were graciously allowed a quick shower at the end. We took Amtrak (it was right on time) from Hermann to Sedalia. That is a special treat for anyone who doesn't get to ride a train very often. Be sure to purchase tickets ahead of time for rider and bike. We got on the MKT in Sedala after visiting the Depot there. We headed for Boonville where we spent the night at The Frederick Hotel. A MUST! The staff was friendly and catered to us and our bikes. Our room was one of simple elegance with an historic feel to it. Day 2 was Boonville to Jefferson City. We stayed at a beautiful, convenient, Cliff Manor B & B where they also catered to trail riders. Thom picked us up from the trailhead. (Do not try to ride your bike across that bridge). We had a relaxing pleasant stay with a to-die-for breakfast. We were toted back across the river, and headed to Hermann (McKittrick trail head). It was a wonderful experience, and I would love to do it again. I recommend the DNR sponsored ride in June. Great support services and organized very well. A beautiful ride. 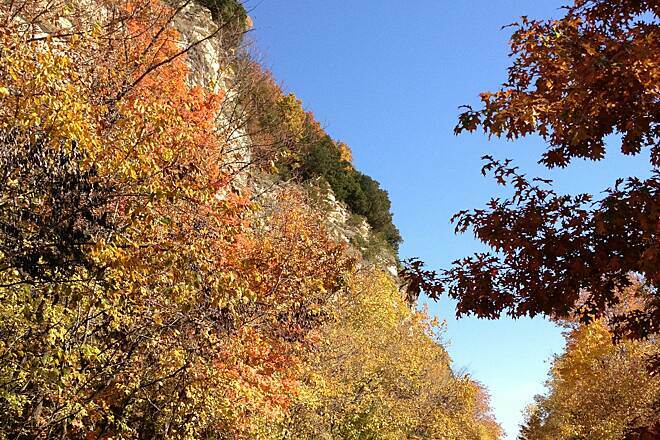 "I completed the Katy Trail the last week of October. Leaf colors were outstanding; weather a bit uncooperative. A couple of years ago I rode it in 5 days; this time 6; next time will be 7. 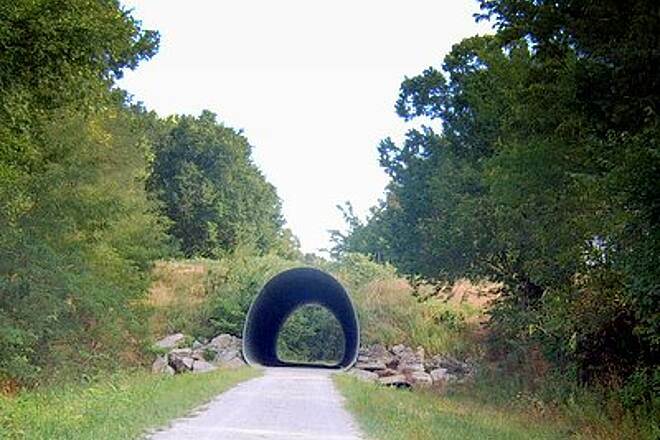 This is a fabulous, well-maintained trail and an asset to Missouri." "We were told to ride mountain bikes on this trail by the state parks folks. With some testing on our local trails, we opted for lightweight 28mm tires on road wheels on our cross bikes. These proved very fast and manageable but about max this trail can handle. I did ride one day in the rain without problems. I met one rider on 23mm tires and he was struggling. He commented that a couple times he had trouble changing lanes to avoid traffic. He did fly however. Next time I'll probably put lightweight 32mm tires on my wife's bike, with road wheels, and 28mm on mine. I believe the ideal bike for this trail is a cyclocross bike with lightweight 32mm high pressure tires. " "I completed the Katy last week and found it to be a riveting adventure of a lifetime. The best ride I've ever done (I'm 60) and a dream to think about now that it's over. Thank you, Missouri!" 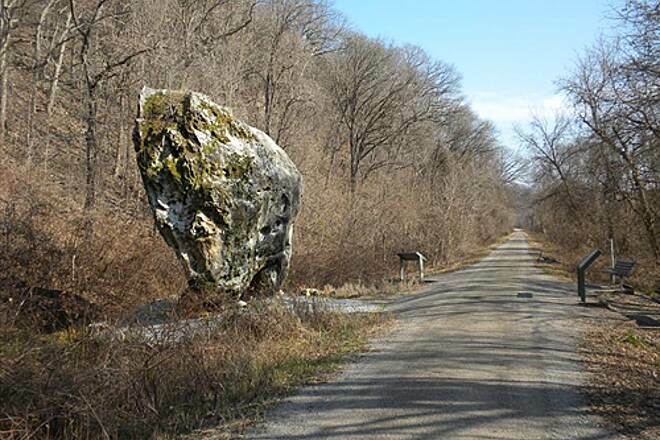 "The trail is made of crushed limestone. It sets up a very hard surface. However, it can fracture and become undercut by erosion. My front wheel got lodged in it and I went over the handlebars. Hazards of the trade. 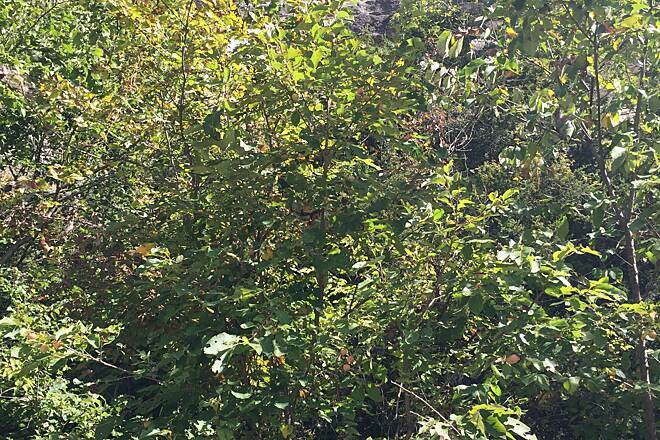 But the embankment was covered with freshly cut poison ivy. Be careful." 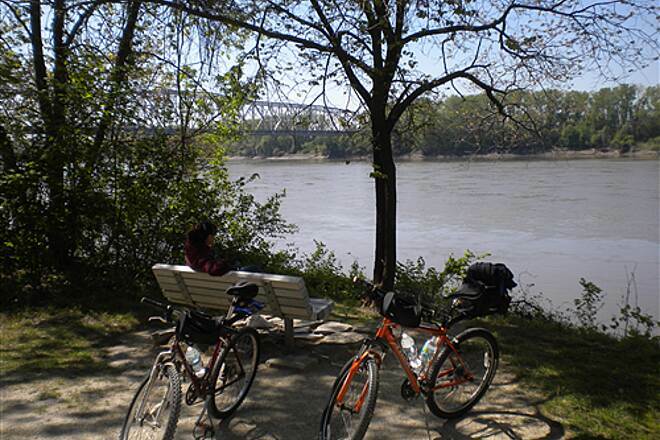 Over a period of six days my wife and I rode from Defiance to Rocheport in round trip segments. All segments that we rode were excellent. We liked the small towns and some of the great places along the way to rehydrate. We like the fact that the trailheads showed the highlights of the upcoming ride. We talked to several people that rode from B&B to B&B and that is probably what we will plan for next time. "Peddled this part of trail both directions16 Aug 06, a part of the trail missed 2 years ago. A great trail even in the dry conditions where some parallel cracks occur." 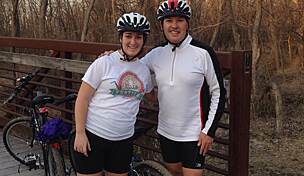 "We rode from St. Charles to Sedalia over the holiday weekend. There is a great bike shop in Hartsburg, which I think is new. We stayed in Boonville at the ""Officer's Club Bed & Breakfast"". This place is super. The owner stored our bikes for us and made us french toast to prep us for the next day's ride. The B&B is located just a couple of blocks from a group of good restaurants on main street. "Just returned from a week on the Katy. Trail is beautiful, clean and easy to ride. People along trail are friendly. Many nice spots to stop and enjoy the scenary. Trailheads informative with maps and clean facilities. Great experience. " I just paid my first ever winter visit to the Katy in late February focusing on the Sedalia to Clinton stretch. The trail was in excellent condition and easy to bike. The trail rode as well as it does during the summer. "Great ride. I rode with my 8 & 10 year old daughters, wife, 14 year old nephew and sister-in-law. 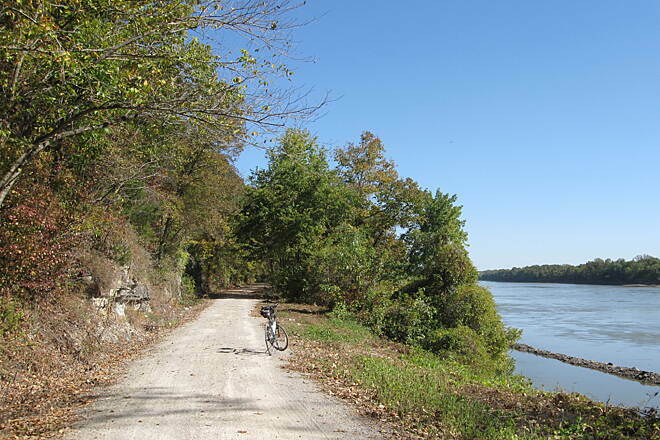 We rode west to east with open corn and soybean fields to finish in shady trails and the Missouri River. Plan plenty of water for the heat around the 4th of July. Small towns with just enough shops to cool down and refuel for the rest of the days ride. Great ride for kids with all types of wildlife early in day and hotels with a pool to cool off." Clinton to St. Charles and back in 6 days! Age of riders 47 and 45 we rode the entire trail out and back in 6 days on a recumbent tandem with a Bob trailer. Great trip. The bike and trailer combined are just over 13 feet long and the combined weight of gear and people is just over a quarter ton. Translation we were a train. Day one Clinton to New Franklin distance 76.4 miles. We registered at the Clinton recreation center and got on the trail 10:00 am. A little later then we had planed. The trail is fine hard packed gravel a good surface for smooth tires. We got into Boonvile just before dark and ate there. We still had to cross the river and find our camp sight in New Franklin. We arrived at the camp sight just past 8:00 pm. We got an early start and ate breakfast in Rochport, lunch in Hartsburgh. Several areas of the trail had minor wash outs and one large tree that was blocking all the trail. Had to disconnect the trailer and move the bike around the tree and over roots and other smaller trees and then go back and do the same with the trailer. We camped at the Rendleman B&B good food and hot showers, it was great. We ate ice cream at a place called Choo Choos a little caboose converted to an ice cream stand just off the trail. Real beds in St. Charles stayed at a hotel. Great ride, it was nice crossing the river in daylight. We ate diner in a bar in Pilot Grove and camped in the town park. The sheriff told us he would come by around 8:00 and open the bathrooms for us. I guess he got busy as we never saw him again. Shortest day of the trip got back just in time to shower at the recreation center and on our way before it started to rain. "I rode the trail from St. Charles to Clinton Sept 20 to Sept 29 2004.I did it by myself with cell phone support from children and friends. Actually I planned to hike and bike but after 2 days of hiking 16m and 15 mi I had a problem with finding a reliable service to ferry my bike from portal to portal so biked the remainder. I took an R&R day in Sedalia. The depot and folks there were super. I stayed in B&B's -almost all great. One of my son's came from Arizona (my home) and rode with me for a day. What a wonderful experience! I hope to do it again next year with a friend this time. Oh by the way, I had never ridden a bike with gears b/4 training for this and I was 68 years old at the time. I loved it! Unbelievably beautiful country. " This past summer I rode 120 miles of the Katy Trail. It was a lot of fun and I hope to do it agin next year! 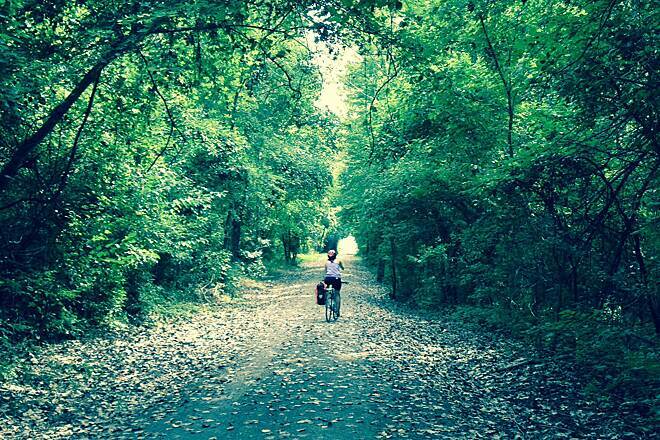 "I am currently riding the Katy Trail. I have already ridden from Clinton to Matson over the course of nine rides. Sometimes I might ride 34 to 52 round trip miles, peddling all the way. I even stop and take pictures. I even read the signs they have about the Louis and Clark expedition. I've learned a lot about the history of the Louis and Clark. I also enjoy watching the eagles fly with there wing spands atleast 3 or 4 feet wide. When I go back in the spring, I'm gonna ride my last 42 round trip miles from Matson to St. Charles. 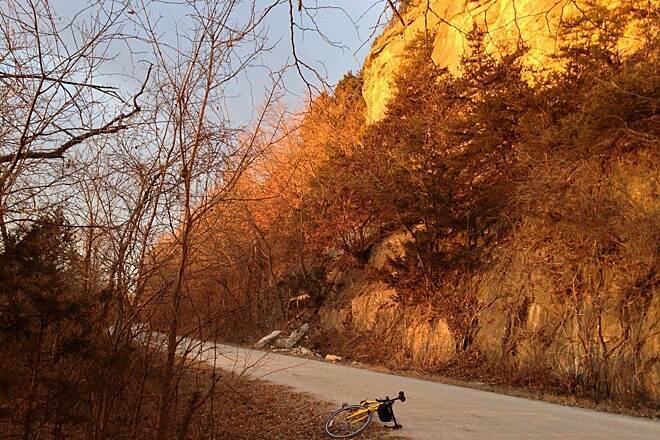 All I can say if you have the guts to ride the Katy Trail, it'll be an adventure that you'll never forget. So if you're ready to take the challenge, just get off of your couch pillow and see if you have it inside of you for this thrill." 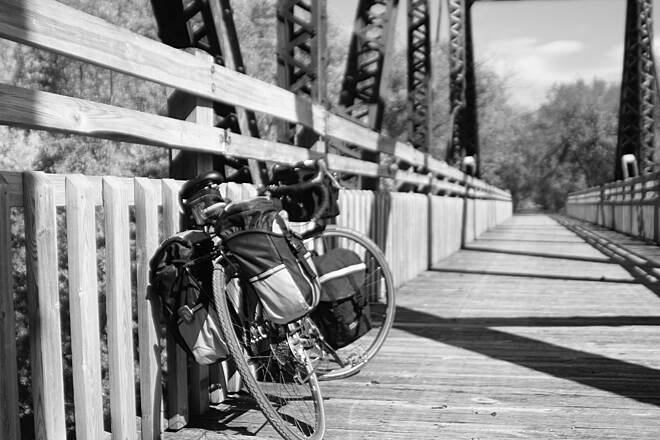 "I have ridden the entire length of the Katy Trail once a year for the past 5 years. It will be a forever (I hope) annual event in my biking calendar. It is beautiful. There are plenty of places to stay and to eat. There are friendly folks along the way. And, it is absolutely beautiful. A 225 mile state park! What more could we ask for?" 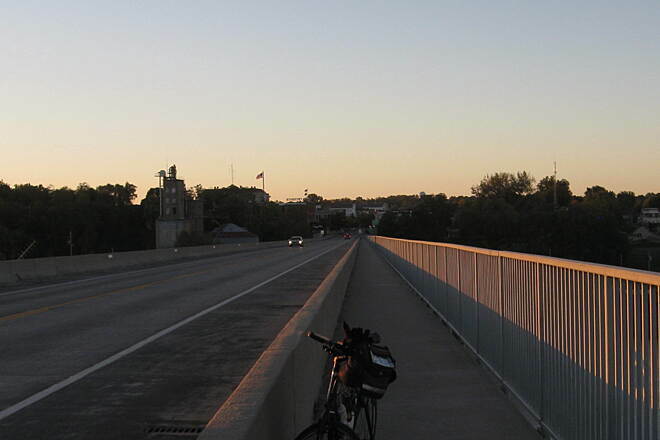 "Previously published in the Kaw Valley Bike Club's (Topeka KS) Cyclometer newsletter: An interesting distinction exists between the folks populating the hill country across the Boonslick Bridge over the Missouri River from the river side dwellers. Mention the Katy to the latter and they’ll tell you more than you may wish to hear. But from Boonville on west, most folks we spoke with were either unfamiliar with the trail or had never heard of it. Road signs and directions were rare- even the Boonville trailhead at the beautiful Spanish accented depot is virtually unknown to many town residents. For those interested in camping, the Bobber Lake RV campground near Boonville (south of exit 103) was a pleasant, quiet experience with clean showers and a reasonable price. The Bobber truckstop/cafe provided decent breakfast/lunch fare. The downside of the Bobber is the 3 mile and one nasty hill distance from the trailhead, okay in the morning, but not what you want to face when you return from a lengthy ride. 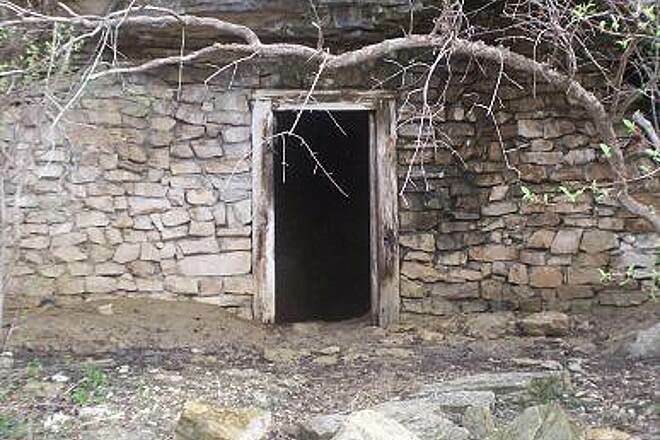 Franklin’s Katy Roundhouse is located trailside, 2 miles east of Boonville (and not to be confused with New or Old Franklin). The Roundhouse also provides the same camping amenities. But food is only available thereabouts on Friday and Saturday evenings at the Roundhouse restaurant. Otherwise, it’s back to Boonville or on to Rocheport (depending on the day of the week). Those wanting to upgrade might be tempted to try any of 3 B & B’s in Rocheport. The Yates House offers good accommodations and breakfast. For those with a taste for the exquisite, the Schoolhouse is rated one of the 25 most romantic B& B’s in the country. 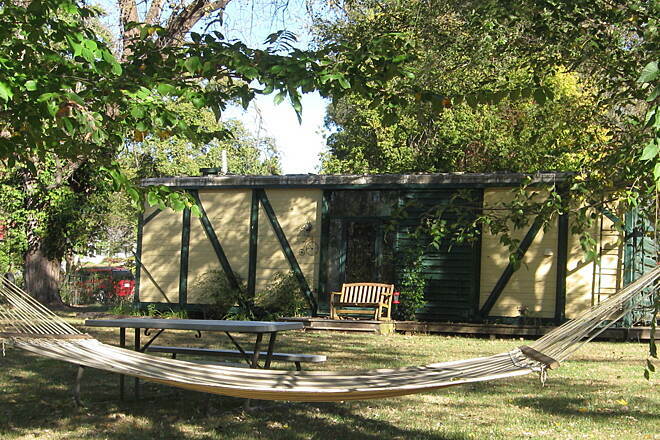 But I have a strong bias for the Katy O’Neil, located trailside with a huge hammock, hottub and a boxcar converted to a swank apartment capable of comfortably accommodating a family of four. Day 1- Clifton City to Boonville (46 miles round trip) A reminder regarding trail conditions is in order here. Thorns are aplenty west to Boonville. We encountered 6 flats on our first trip through. After reinforcing our tires (slimed or lined tires) we had no further difficulties. I would suggest starting an ascent from Boonville and marvel at the Katy engineering out of the river and into the hills. The grade is biker friendly and most pretty. Notice how the limestone was cut through, leaving rock walls 30 feet above in places, only to come out over ravines dropping 50 to 100 feet below on either side of the trail. 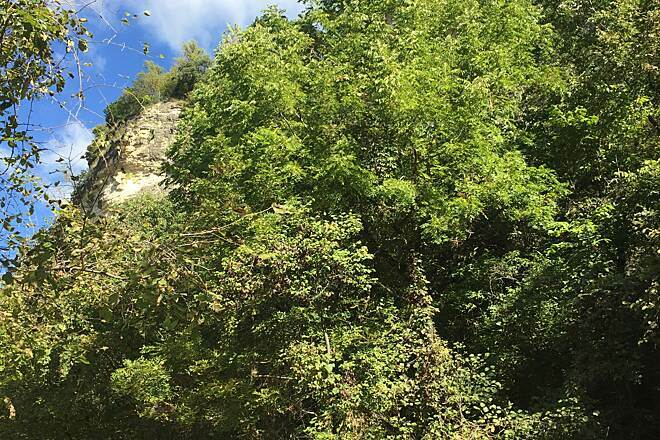 The woodlands are lush, containing seemingly every deciduous tree imaginable. Note: this section is a magnificent display of color during October! Between the destination points is Pilot Grove; a good resting spot is Deon’s Bar & Grill next door to a well stocked deli inside Gerke’s Grocery, both located across from the trailhead. Two blocks away is Becky’s Burgers, whose soft serve ice cream was a hit with Linda. The trail then descends to Clifton City- the forest again diverted my attention from the climb back out. The Lamine River lazily churns alongside the Katy for a mile. 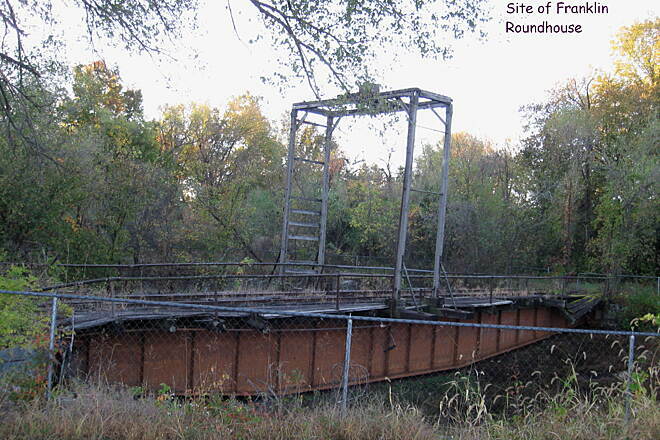 Then it’s traversed by one of the remaining girded trestles. A good photo-op of riders on the bridge can be obtained from the adjacent roadway bridge, accessed 1/6th mile further down the trail. True to her last year’s warning, Blackie’s daughter is no longer stocking the old trailside refrigerator in Clifton City. Soft drinks are available from a vending machine up the hill outside a garage. Sundry items can be purchased there during the week but the owner closes at noon Saturdays for the weekend. Day 2- Boonville to McBaine (45 miles round trip) Unless you head out from the aforementioned adjacent Katy Roundhouse campground in Franklin, I would head west from Rocheport, then east to McBaine and back. From Boonville the Katy follows the Missouri River valley the remainder of the trail so you will continuously be on fairly level grade. 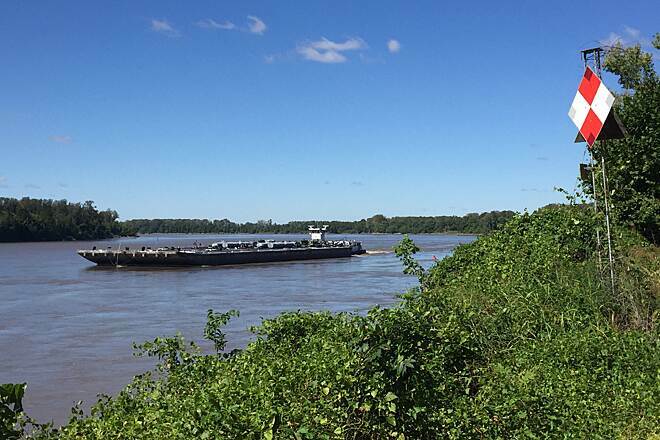 But, as soon discovered leaving Boonville, you will seldom be along side the Big Muddy. Instead, you’ll just catch glimpses of it on occasion and sometimes travel alongside it for a few miles before it mysteriously disappears again. Passing the old clay tiled elevator at Pearsons (beyond mile marker 185), notice that the once rounded hills give way to increasingly taller cliffs as you enter into the Moniteau Bluff region. 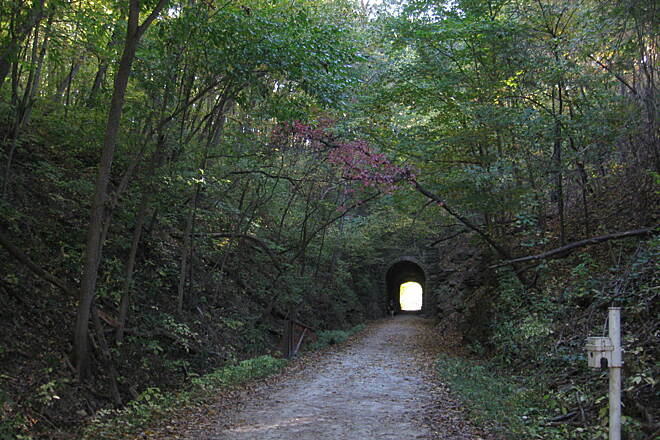 As you approach Rocheport, you will pass through the 243 foot long Katy tunnel built in 1893. Stop for lunch at the Trailside Cafe (bike rentals & repair service available) or sample a gourmet treat of Dungeness crab meat at the newly opened Cracked Crab. Or head up the hill, if still in possession of very strong legs and no fear of narrow roads (or you have a car) for a fabulous view of the trail below as you feast at Les Bourgeois vineyards restaurant or A-frame. Just don’t go to Rocheport on Mondays- every eatery except the Trailside is closed. Just east of Rocheport (~marker 178) is a small memorial dedicated to Ted Jones, a Missouri philanthropist who financed a significant amount of money for the development of the trail. 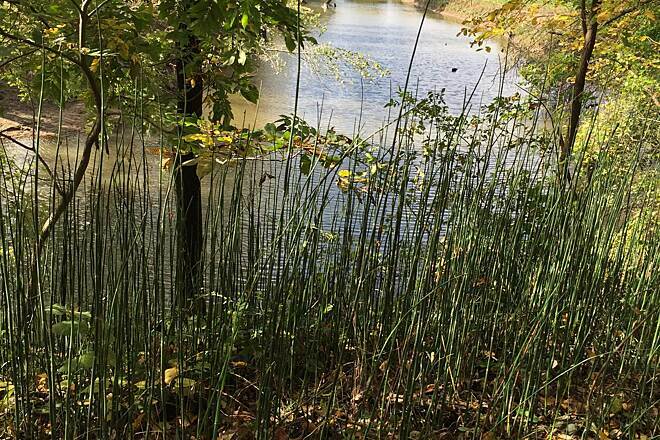 When Missouri was deeded the right of way for the state park, rural legislators balked and refused to fund the building of the trail (sound familiar?). So along came Jones and the trail construction was instantly funded. 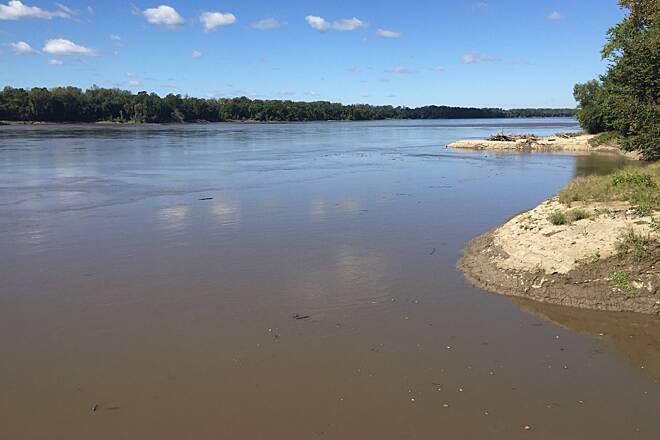 When a significant portion of it was washed out by the flooding Missouri River in 1993, Jones’ widow again stepped forward to pay for the repairs. The Katy is best known for its beauty in the next 6 miles. You find yourself walled in between the towering bluffs on your left and the Missouri River on the right. Be careful rubber necking for lengthy intervals as this section is crowded with other bluff gazers as well and crashes are entirely plausible. As we cruised this section, 4 deer crossed in front of us and made their way up one of the many valleys carved through the walls by creeks and erosion. 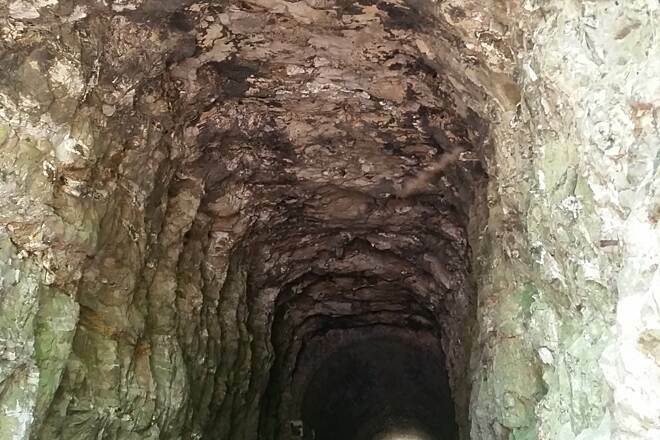 Near marker 176 is a cave about 15- 20 feet above the trail where an unseen biker unknowingly serenaded us with a flute recital. Also of note is the Lewis & Clark Cave beyond marker 175. 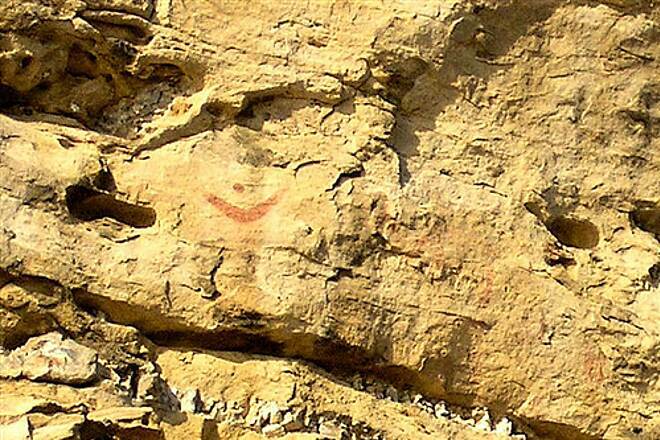 I finally (after 10 previous unsuccessful attempts) located the small remaining maroon Native American petroglyph about 40 feet above and 10 feet to the left above the cave entrance. 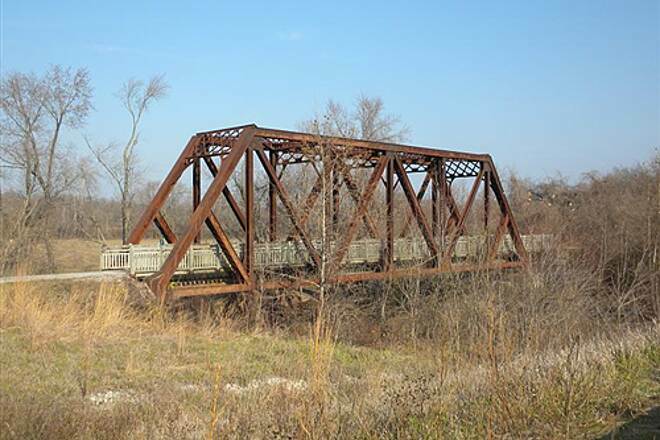 Another large trestle (across Perche Creek) can be viewed 2 miles away in the distance when you reach the straight away at Huntsdale. At that point, you reach the intersection with the MKT fitness trail which swings north 9 miles to Columbia. Just past the bridge you’ll be greeted by the Columbia water treatment plants of McBaine. A tavern nearby provides a variety of nourishment before the trip back. " A July excursion is not typically the best climatic condition on the Katy unless you have a passion for heat and dust. Instead, my preference would be to go just after a good rain and cooler temperatures. The trail is generally useable soon after a heavy rain and the limestone dust won’t be nearly as problematic. Riding a week after the last rain usually results in a gray bike and rider by the day’s end. 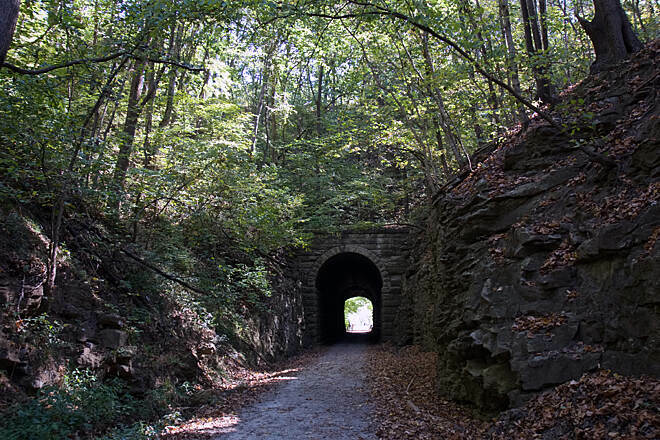 The adjoining M-K-T Fitness Trail was a Katy RR spur line that descends nearly 9 miles from Columbia where it joins the Katy Trail just west of McBaine. 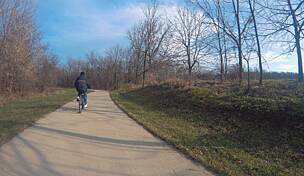 The Fitness Trail is the only location where you will encounter hills east of Boonville. The rest of the trail simply follows the riverbed of the Missouri. But the climb into Columbia is gradual and terrifically scenic. For those inclined to camp, I would recommend considering the RiverView Traders Store, run by knowledgeable Osage Native Americans in Wilton. Maggie & Robert Riesenmy were two of the most interesting, as well as compassionate, individuals I have met on the trail. 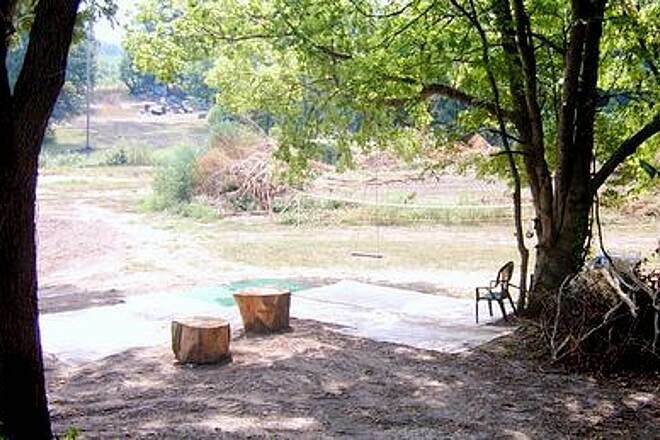 One mile west of Easley, Cooper’s Landing is a bike rider’s camping enigma with a pretty view over looking the river. 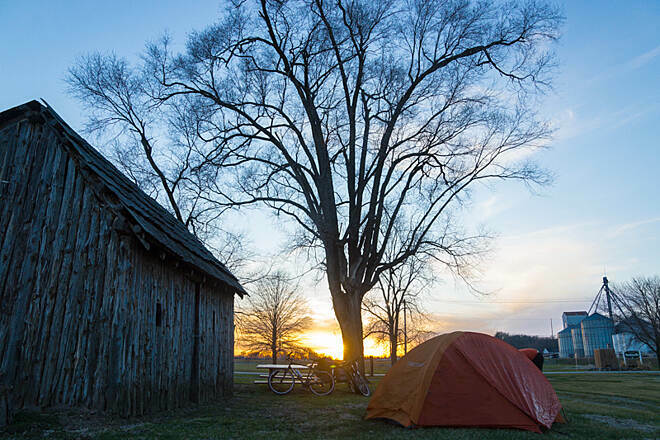 Both campsites charge a basic tenting fee and prices go higher for showers, towels or laundry. Each also have indoor facilities available as well. The hand carved wooden tables and benches at Cooper’s and the lush greenery and teepee (you can rent it overnight) at RiverView make both places must stops. The recently restored and reasonably priced Globe Hotel B & B in Hartsburg is a block from the Katy. Several B& B’s and numerous motels are available in Columbia and Jefferson City as well. Just avoid staying in Columbia on Tiger football weekends. I suggest not to leave the tail and attempt to ride into Jefferson City over the bridge. From North Jefferson US 54 is a dangerous freeway without bike lanes. Nearby side trips to Rock Bridge Memorial State Park, exploring Columbia and seeing the Thomas Hart Benton murals in the beautiful Statehouse all are worth some extra off bike time. Good food is available in many spots in Columbia- for a special dinner, consider eating at Everett’s, just south of exit 127 from I-70. If you prefer one way transit and bike the return, call Creason’s Shuttle Service out of Hermann (573-694-2027). Although the service may seem a bit expensive, you can double your mileage on a trip if you are satisfied with one way viewing. Day 1- Columbia to Hartsburg (51 miles round trip) I suggest you begin in Hartsburg (or go east to Hartsburg from Wilton/Easley if you camped there) and then head west to McBaine. You’ll come out on the river twice for brief views of the Big Muddy and occasionally travel beneath towering bluffs. The trail is fairly well protected from wind by trees that have grown alongside the path. As you approach McBaine, you will pass by the city of Columbia waste water reprocessing plants. 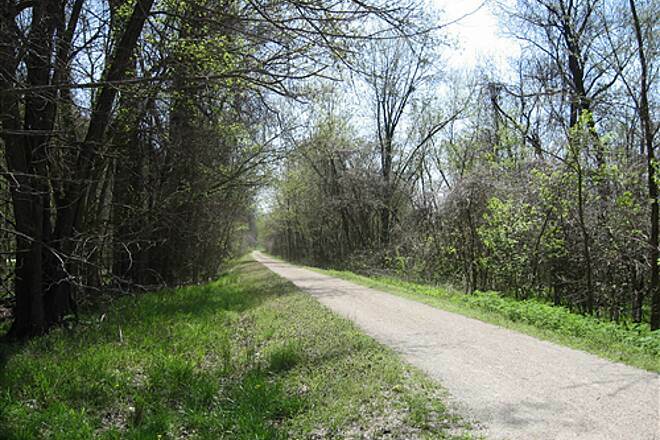 The M-K-T fitness trail branches north about a ½ mile west of McBaine. Be careful, as you may encounter trucks or construction equipment on the trail for the next 3 miles toward Columbia. This area is openly exposed and contain a significant detour off the original trail over rough surface. 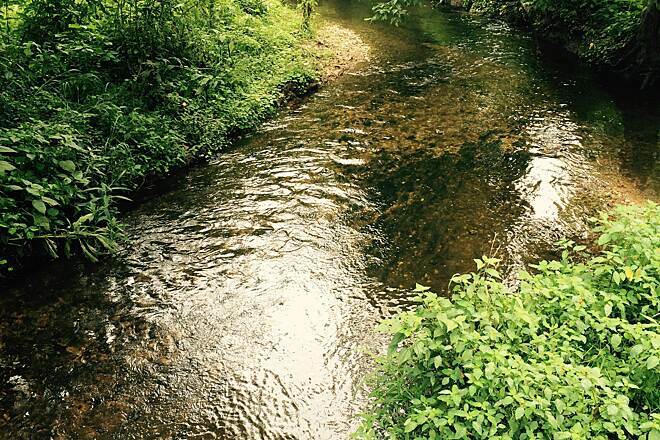 Once you return to the original trail, you will be rewarded by traveling along and frequently crossing Hinkson Creek which (after sufficient recent rain) provides a babbling brook background into town. Photo-ops are continuous- I suggest using 400 speed film as the trail is deeply forested. Speaking of pictures, you may have noticed in the previous newsletter of my interest shooting bridge shots. The full grid trestles near Cooper’s Landing and past the water works on the M-K-T (~ marker 6.0) are good points to photograph riders crossing either bridge. As you approach Columbia, you will encounter a substantially increased number of trail users- walkers and joggers as well as cyclists. 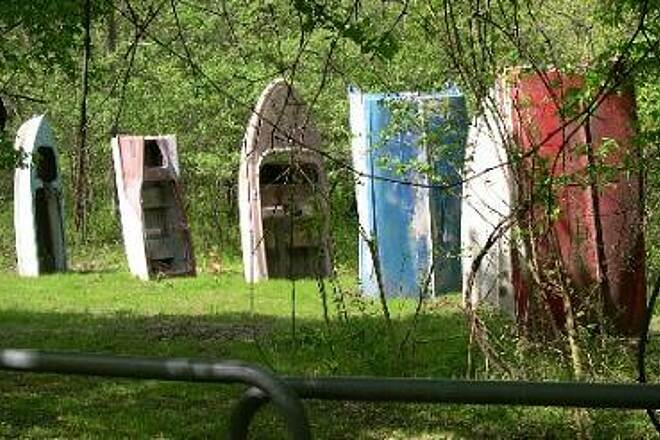 Emergency phones, toilets at trail access points and side trails leading to picturesque ponds are in abundance. Suddenly and without warning, the trail abruptly deposits you at the corner of a busy intersection of Stewart and Providence. I suggest dismounting and crossing both streets to the northeast corner before proceeding north up the sidewalk. Veer northeast on a walkway one block (little signposts guide you); then head 2 blocks north along a small park until you reach the “trailhead” at Broadway Street. The eloquent Katy Depot has been converted to the Coliseum Sports Bar & Grill serving a full menu including a most tasty veggie club sandwich. Day 2- Hartsburg to Tebbetts (44.8 miles round-trip) I must admit that this section of trail was my least favorite. The route generally follows nondescript farmland in the river bottom with occasional seclusion from adjacent Highway 94. 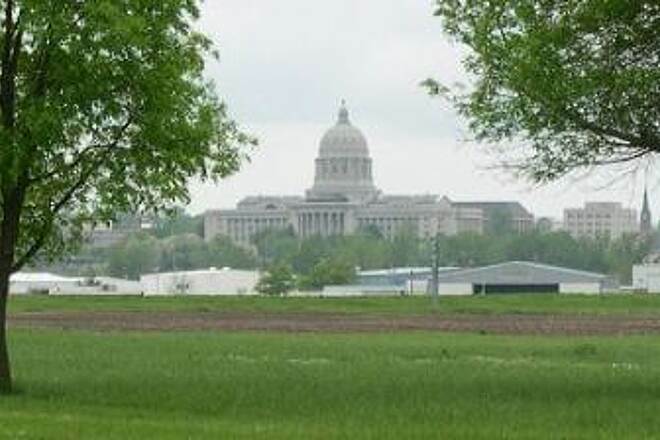 A glimpse of the Missouri Capitol and other south side landmarks break up the monotony of the ride east of Jefferson city. My sole motivation of riding this portion seemed to be the ability of saying I’d ridden it. No food is available except at Hartsburg. Thus, I would again recommend starting at the east end and eating lunch at Hartsburg’s Thornhill Vineyards Winery or either of the 2 tavern/cafes. For the rest of the trip, be sure to pack plentiful snacks in your panniers. " 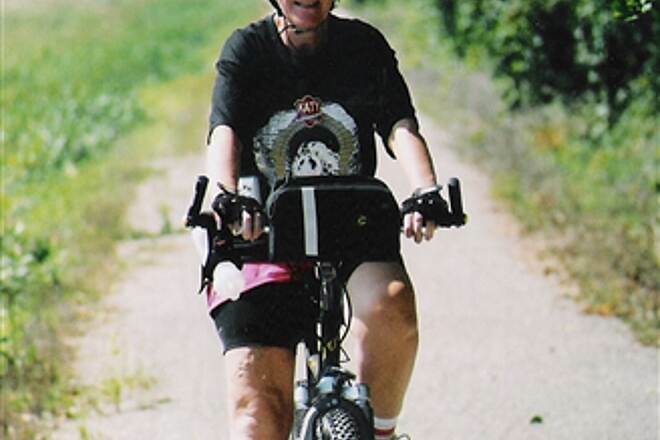 "From a trail review originally published in the Kaw Valley Bike Club News (Topeka KS): We rode wide tire bikes; I used a mountain bike while Linda won’t ride anything but her hybrid. We saw a few road bikes but the prevalence of thorns on the trail made lined or slimed wide tires almost a necessity. I found that carrying gear in panniers was a good idea. Food, extra tubes, rain gear, camera/film are essentials. And take plenty of good quality drinking water along. I find that I drink a lot more when it tastes decent. Keep in mind that rain is more prevalent in Missouri than Kansas so be ready for it. We typically rode 40 to 50 mile round trip segments which demanded good endurance ability. We rode at a relatively slow pace for enjoyment as well as self preservation. Those last 10 miles were often agonizing. If you aren’t in condition for long rides, break the route down into a 3 or 4 day venture. The trails are gently graded which made for no steep climbs but also little or no coasting. The surface is well ground limestone or “chit” and we seldom encountered washouts or trail vandalism. 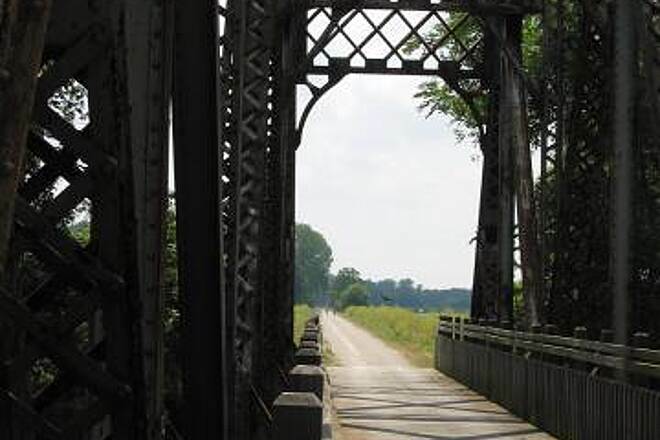 Bridges are mostly authentic Katy trestles with wooden railing installed for rider protection. Trip # 1: Clinton to Clifton City- 98.4 miles round trip. Camp at the state fairgrounds in Sedalia. We generally drove to any convenient trail head and rode in a direction most suited to weather/ wind conditions and food availability. Starting at a midway trail head allows you to stop early if the trip you planned seemed a bit overambitious halfway through. The northwest corner of the fairgrounds in Sedalia made for a great camping location as bathrooms with warm showers are located there and the overnight fees are most reasonable if you can find anyone to pay. Just don’t try to camp there at the time of the fair in August. Breakfasts at the North 65 Cafe or across the road at a greenhouse/cafe were inexpensive and tasty. Day 1 (50.8 miles): Windsor makes for a good starting point for the trip between Clinton and Green Ridge. Besides a grocery and service station, we were most happy to discover a Subway sandwich shop 2 blocks from the Windsor trail head- though I am not a fan of national fast food chains, it really hit the spot after 30 miles of riding. The trail is open to horses between Clinton and Sedalia (bikers need to yield for obvious reasons) though we only encountered one horse party on that stretch. 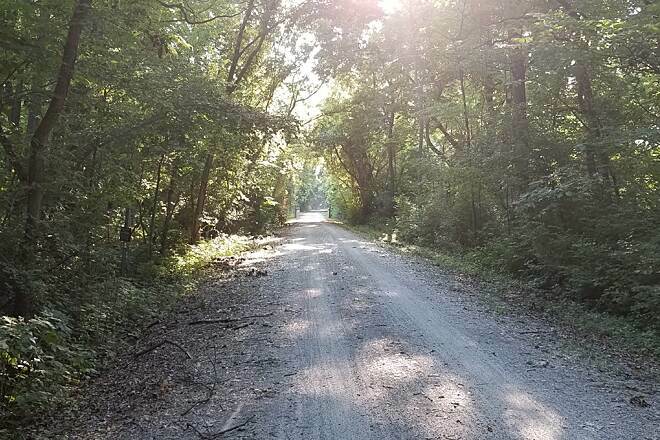 The initial 7 miles of gradual climbing out of Clinton paralleled the highway, but eventually a descent into a valley behind Calhoun enabled a sense of solitude felt until reaching midtown Sedalia. (Note: except for the toilets at Calhoun, there is no other reason to ascend the hill off the trail). 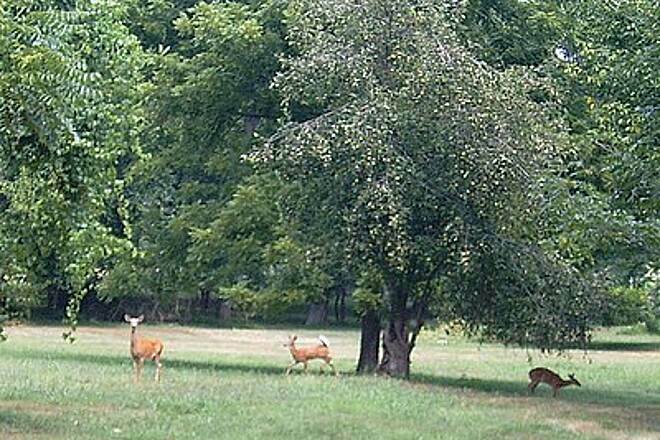 Beautiful hardwood forest land lie on either side of Windsor. About 5 miles northeast of Windsor, you are back in farmland and probably the most exposed region to wind anywhere on the Katy. This, we discovered, on a 25 mph south wind day, making for very slow going. Green Ridge is a small unasuming town with a Casey’s next to a small park. Day 2: (47.6 miles) Leave right from your campsite at the Fairgrounds and ride south on Clarendon Rd to the trail head in south Sedalia. 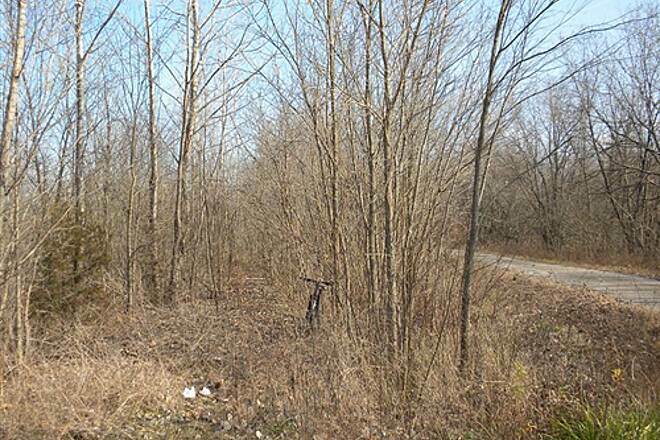 To the southwest you will be in woods, gradually thinning to pasture/ farm land into Clinton. 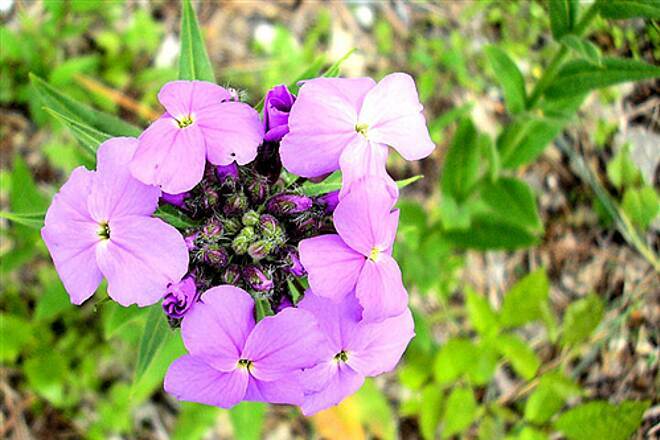 In May we found some interesting wildflowers along the trail. I hope you haven’t tired of Casey’s in Green Ridge yet as it is the only food available to the south. I was tempted to head off the main trail onto the occasional equestrian paths on the return trip. From the campground northeast the trail crosses increasingly busy Sedalia streets so if you brought the kids, keep them on a leash as Linda had to do with me. Few natives we spoke with seemed to take much interest in the trail and I suppose that applies to drivers as well. Eventually the trail temporarily ends at the magnificent old Katy depot. From there, follow obscure signs northeast until you reach the trail head on Griessen Road. The detour pretty well avoids dangerous streets until you are safely back on the trail. Now the scenery gets interesting. From Sedalia to Boonville, you are in Ozark-like woods that are beautiful at every turn. In my opinion, that stretch rivals the majesty of the Rocheport area in photo opportunities. When you reach Clifton City, you may have a difficult time turning around. At that trail head was an old icebox filled with goodies paid for on an honor system for trail users maintained by a woman known as “Blackie’s Daughter”. When we were last through Clifton City, she had served notice that vandals were likely going to cause the end of her supplies, however. A fledgling service station with a small stash of sundry supplies up the hill was being opened at that time. If neither are in operation, you’d have best brought food with you." As we traveled the trail, we found that we would rarely ride a mile or two before encountering beautiful blue birds (which for the most part were indigo buntings who spend considerable time trailside eating before ascending just as you arrive). The eastern blue bird, Missouri’s winged icon, is a bit larger and bears a brownish orange breast- they seem to be a bit shyer than the ubiquitous buntings. Also keep an eye open for deer, muskrat, frequent toads, and a salamander/skink like creature darting across the trail. Linda’s least favorite critter turned out to be a 6 foot long black snake that she rode over, startling her and probably not doing much to endear her to the reptile. We frequently happened across several interesting snake varieties, all seemingly benign in nature. I was told of occasional sightings of copperheads but never saw any of those rascals. Camping proved to be a bit of a challenge. Although the Guidebook indicated that tenters were welcome at the Sundermeier RV Park in St Charles, we were readily denied camping space there. Instead, we bivouacked at the Pinewoods Campground outside Wentzville, a huge and rather primitive experience with, so help me, a family reunion of the 6th generation of the infamous Kallikak brood. At least in Wentzville we found great pasta at Stephania’s, good Mexican cuisine at El Valquero’s, and a terrific Sunday breakfast buffet at the West Allen Bar & Grill. 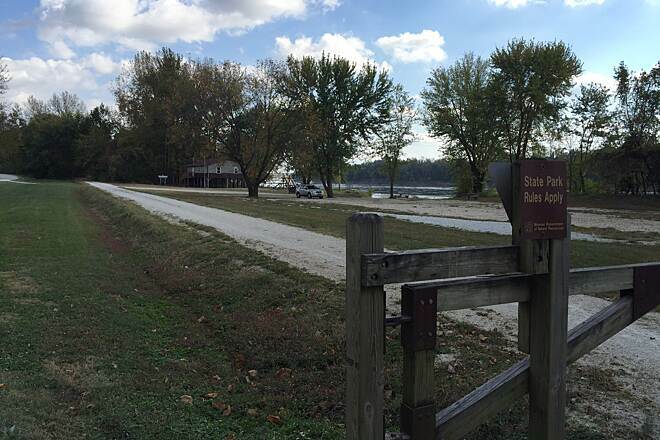 Another camping option might be Babler State Park south of the river and west of St Louis. Of course the St Louis & St Charles areas are bustling with B & B’s and a plethora of motels. Likewise, Augusta and Washington, across the river from Dutzow, also have well acclaimed accommodations. 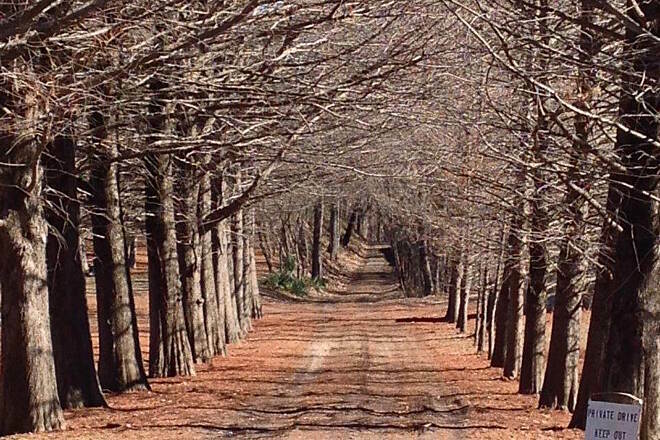 Day 1 Treloar to Matson (47.6 miles roundtrip) Tree canopied trails typically break out into pasture land, then back to cover. 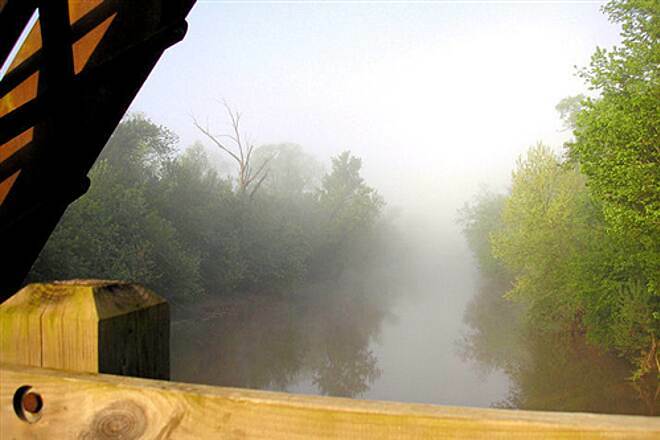 Several historic Daniel Boone relics are nearby, if you get the urge to get off the trail. Pick any convenient spot as a starting point as Marthasville and Augusta are in the midst of the section and both were great watering holes. Loretta’s Place in Marthasville served up a wonderful Sunday lunch buffet. The Augusta Winery, one of three wineries in Augusta, served wonderful food and contained an excellent local microbrew as well. Both towns have well equipped bike shops, too. 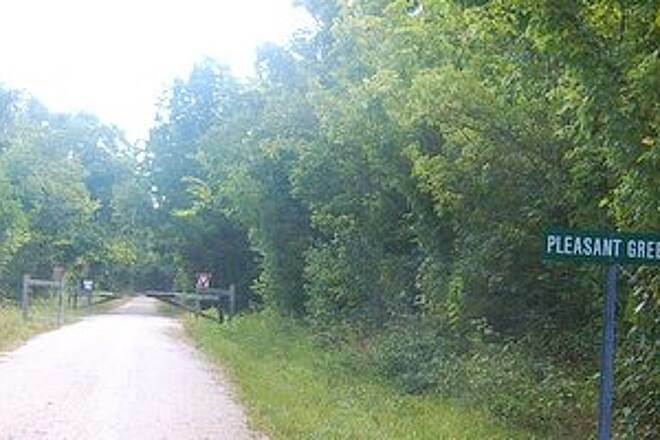 One odd spot between Treloar and Marthasville contained signs placed by the Missouri Dept of Natural Resources warning bikers that an adjacent landowner did not share the “philosophical ideals or aesthetic convictions” of trail users, thus best to move through the area quickly. Apparently, the owner has a reputation similar to a certain individual residing along K-4 for his disdain for cyclists and has “dusted” a few travelers with gravel from his pickup. I wonder if they are related. Day 2 Matson to St Charles (42.2 miles roundtrip) The Missouri River seems to make more frequent appearances on this section of trail than any of the previous portions. I was particularly impressed by the hardwood forest east of Weldon Spring. Except for a rather bland and exposed area alongside Greens Bottom Road, the scenery rivals any other previously described section. Well kept up gardens as you enter St Charles suggest that property values typically increase alongside a recreational trail. I think starting at Matson is a good choice as there is no food available until you get to St Charles. From famine you will hit feast considering the restaurant choices are as numerous as the cuisine is special. Whatever level of food service you prefer, you are likely to find it on Main Street. Service was slow but the microbrew at the Trailhead Brewing Company hit the spot on a 90 plus degree day. Be sure to allow plenty of time to cruise the 13 block corridor by foot- give yourself a minimum of 2 hours to check out the town; but bring a checkbook, empty panniers and strong legs to carry purchases back with you. 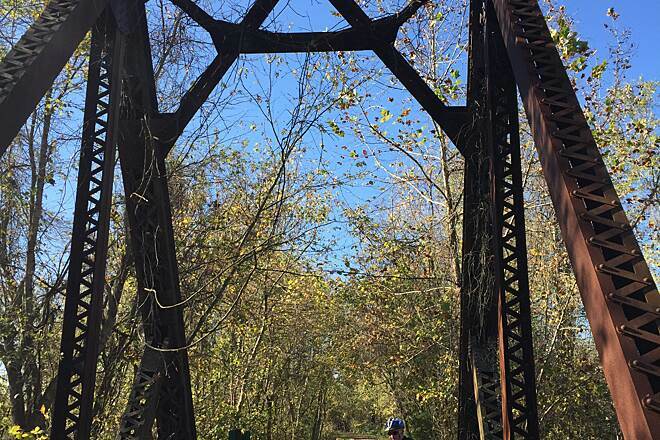 Plan on encountering increased numbers of trail users near St Charles as the St Louisites have certainly discovered their state treasure. The final 12 miles on to Machens were not constructed when we rode this section due to soft spots along the route. Thus, the trail ends abruptly just east of St Charles." 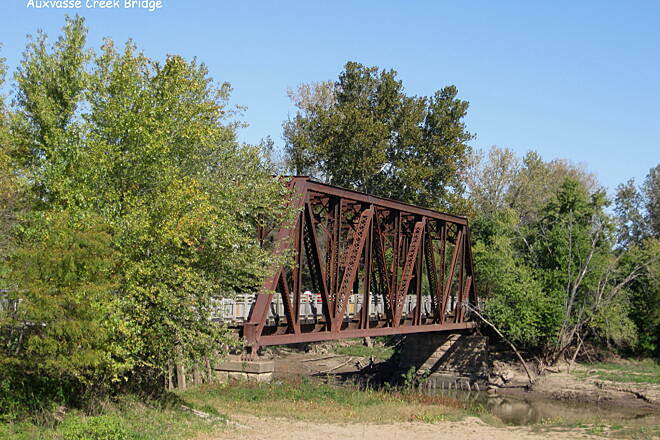 "Excerpted from the Kaw Valley Bike Club's (Topeka KS) Cyclometer newsletter: The section between Tebbetts and Treloar interesting was the towns along the trail as often as the biking of the route. 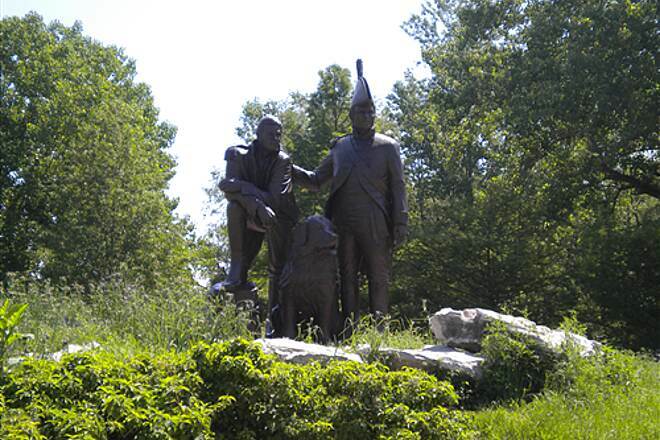 Daniel Boone, Lewis and Clark, German immigration- the area is a historian’s delight. When competing railroads built along both sides of the river, towns sprang up approximately 10 miles apart from one another and flourished as railheads. Over the years many towns survived the loss of the rail line, only to become a unique community distinguished by its agriculture, townsfolk or proximity to natural resources. 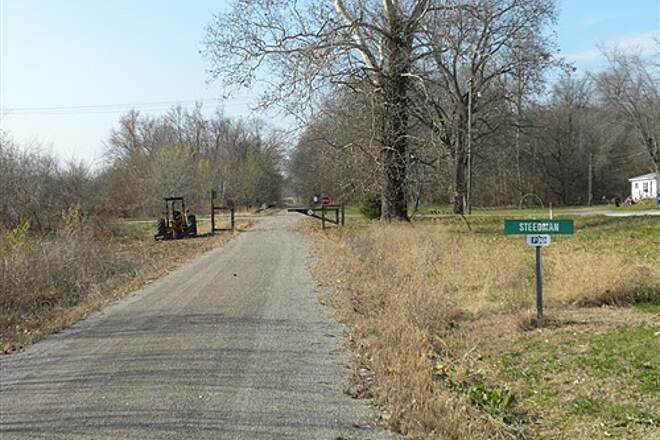 The Katy is accessible most of this route from Missouri State Highway 94 which typically runs parallel to the roadbed from Jefferson City eastward. Probably the most notable town along the Missouri- other than the capital- is Hermann, noted for its wines and German ancestry. I first visited the town in 1975 when our car broke down forcing me to spend the night. A walking tour convinced me that this special place was a sightseer’s haven, waiting to be discovered. Sure enough, returning 25 years later, we found Hermann a booming tourist town. What do you do when you live in a 150 year old house following your retirement? Well turn it into a B & B, of course! At least 40 of these are situated in Hermann, many biker friendly, making this town a logical spot to bivouac in style. Jefferson City, too, offers its fair share of accommodations and sights (don’t miss the Thomas Hart Benton murals in the Capitol). Keep in mind that the trail is inaccessible from either town unless you want to take the risk of crossing on bike-lane-less bridges. If you prefer camping, we found the Lazy Day Campground much to our liking. Once again tents were outnumbered, 50- 1 by the RV’s but the natives were friendly and the campground sublime. 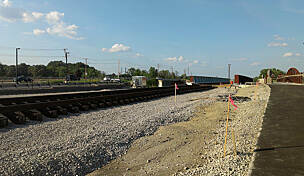 The only drawback was its location (adjacent to I 70’s Exit 170), 19 miles from the McKittrick railhead. The Steamboat Junction B & B near Bluffton offers both lodging and camping. The hill above the trail at their site provides a welcome climbing challenge after riding in the flats all day. Linda & I recently took 12 year old grandson Nick on favorite parts of the trail, despite our loathing of July trail conditions. We met several parties that were riding the trail one way between Sedalia and St Charles after riding Amtrak the opposite direction. Amtrak allows bikes on board but reservations are a must- call 1-800-872-7245. Since Congress is threatening cuts again, this may be the last year that service is available. Day 1 Tebbetts to Rheinland (52.4 miles round trip) Start at either end depending on logistics as to where you spent the night. The trail parallels the highway most of the distance except for 4 scenic miles east of Portland when you are sandwiched between bluffs and river- the rock wall is the highest along the Katy. Otherwise the trail passes along agricultural bottom land beyond the trees lining much of the trail. One positive thought about doing this section over Labor Day weekend: we chanced upon Mokane’s annual festival on that particular Saturday. Locals insisted that we try the barbecued mutton (tasty fare) and the homemade desserts were delicious. Otherwise, the grocery offers needed refreshments. The Riverfront Bar & Grill in Portland was a welcome oasis from the heat. But I submit that stopping at the S.O.B. (Steedman’s Only Bar) is a required prerequisite to being a Katy veteran. Needless to say the monotony of the trail is broken nicely by these adjoining towns. And you can do them all twice on the round trip. Day 2 Rheinland to Treloar (40.8 miles round trip) A logical starting point is McKittrick (across the river from Hermann). Take plenty of food and drink with you as you won’t find nourishment anywhere but Gosen’s Restaurant & Bar in Rheinland. The scenery is similar to yesterday’s- mostly farmland with a pretty 6 mile stretch west of Treloar. I made the mileage longer on the first day due to the many eateries prevalent then as compared to day 2." 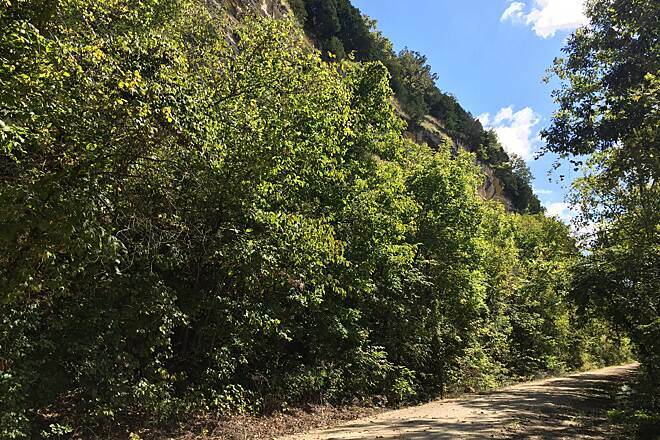 "The beer stuff is later, first you have to read this...The KATY is definitely one of the best trails in the country, as it offers a long and scenic multi-day ride with NO CARS! I was lucky enough to have once lived on the route and spent many days on the trail. 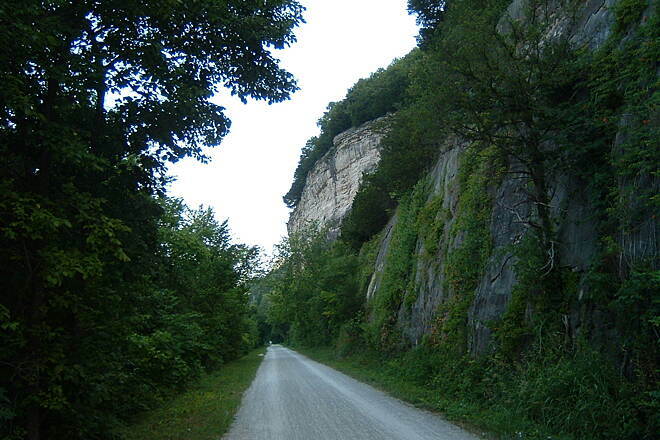 The stretch between Rocheport and Jefferson City is probably the prettiest, with lots of bluffs and what-not. The three times I did the trail in its entirety, I camped two nights and stayed in town the middle night. This was especially convenient for me as I lived in Columbia, a town on the MKT spur of the trail. If you would like to stay a night in Columbia, which you definitely should, be sure to check out the Flat Branch Brewing Co. and Eatery. It is on 5th Street, exactly five blocks east and a bit north of where the MKT drops you off (Providence and Stewart). While there you can check out the Katy Trail Pale Ale, although I would recommend the Brown Ale or Smithton Mild or one of the seasonal brews (mmm..pumpkin ale). The food is also very good, although I am told they no longer offer Bangers & Mash like they did when I lived in Missouri . . . sigh. BTW, the MKT spur is about 9 miles long and very pleasant. 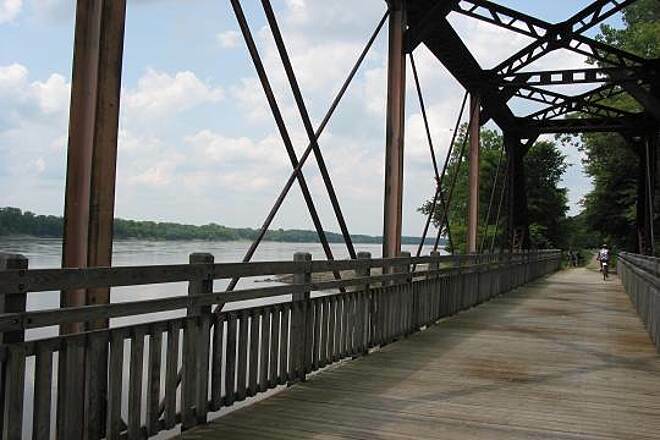 It meets the Katy Trail at McBaine and is hard to miss, as this is the most populated part of the trail. If you are a birdwatcher, I first offer my condolences and then recommend that you check out the Eagle Bluffs Conservation area which is very near the junction in McBaine. This is a marsh area which harbors lots of interesting waterbirds, depending on time of year. 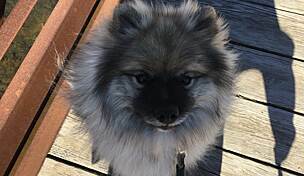 Finally, consider stopping in Pilot Grove for provisions at Gerke's grocery if you need them; nothing too special about the place, but I have family there so it must be cool!" "My husband, a friend and I rode the Katy the last week in September. We travel with a RV and did the trail by setting up in the area and riding in both directions, out and back, before moving further along the trail. This makes the trail longer, but we alway enjoy seeing things from both directions. 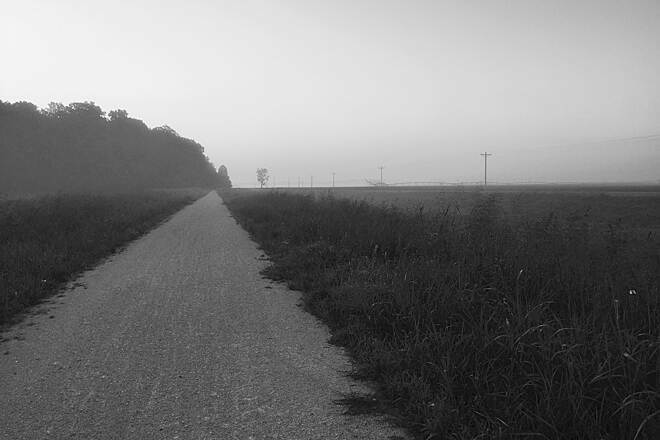 We used Brett Dufur's guidebook and BIKING MISSOURI'S RAIL-TRAILS by Shawn Richardson. Both were helpful and complemented each other nicely. Katy Roundhouse Campground in New Franklin was great. Many recent improvements. We wished there were more campgrounds of this type so convenient to the trail. We noted with interest the sign posted along the trail just east of Peers which asked riders to not stop in the area. Didn't think much about it until at a farm located on both sides of the trail. Suddenly, two people jumped into a truck and in a cloud of dust and gravel sped recklessly across the trail on the farm access road. I hadn't expected that much speed so fast and if I hadn't stopped suddenly I surely would have been hit. We mentioned this to other riders in the campground and evidently these people are well known for being antagonistic to trail riders. We are not from the area and knew nothing of such hostilies. Bottom line - heed the signs on both side of this farm! 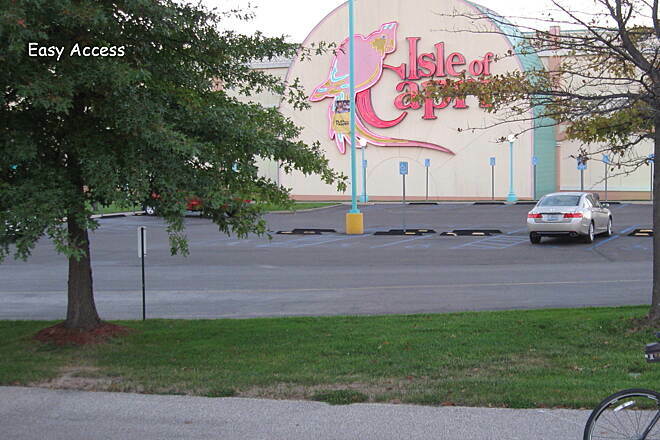 This minor incident didn't dampen our great joy in the best ride of 2002." "My brothers and I did the whole trail during April '02 and HEARTILY recommend it. The ""cottage"" industries along the trail can be slim sometimes, and everything, and I do mean everything in Rocheport, MO, is closed on Mondays. Great rest stops...trail residents friendly. Really look over Coopers Landing in Easley before deciding to camp there. All in all a great start for the Dalton Boys in their first of many to come. " 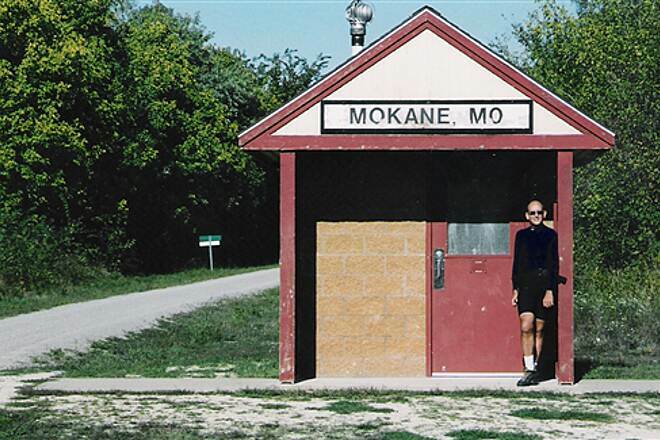 "We rode the trail from Clinton to St. Charles during the first week of June, 2002 on our tandem bike. My favorite section was from Sedalia to Pilot Grove, although there are many parts nearly as nice. We especially enjoyed the birdwatching. 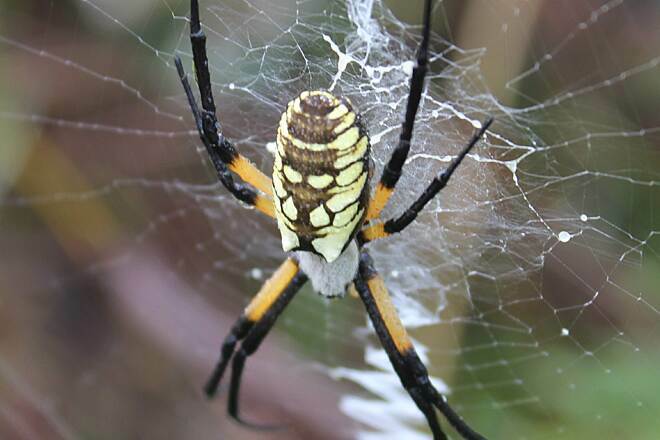 Take some bug repellant for rest stops along the river. I discovered what Lewis & Clark were not kidding about the mosquitos." 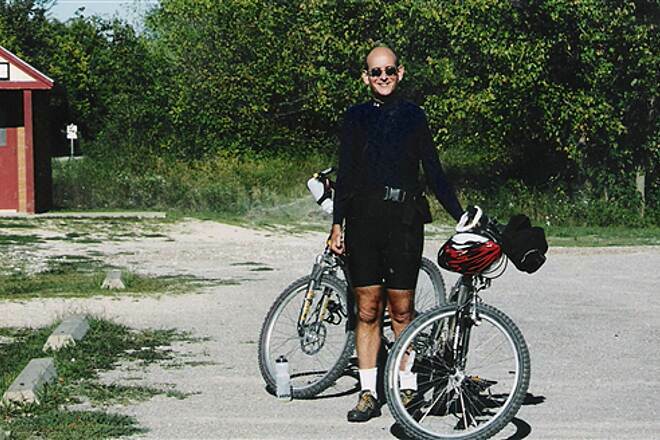 "I just finished the Katy ride 2002 and enjoyed every minute of the ride and the trail. Wouldn't really recommend a 23mm tired bike since the trail is lime stone and any roadie will know what that can do to tires. use a hybrid, i had 38mm tires and could crak plenty of speed if so desired. But, there is also every reason to poke along and ""smell the roses"" . thanks mdnr!" 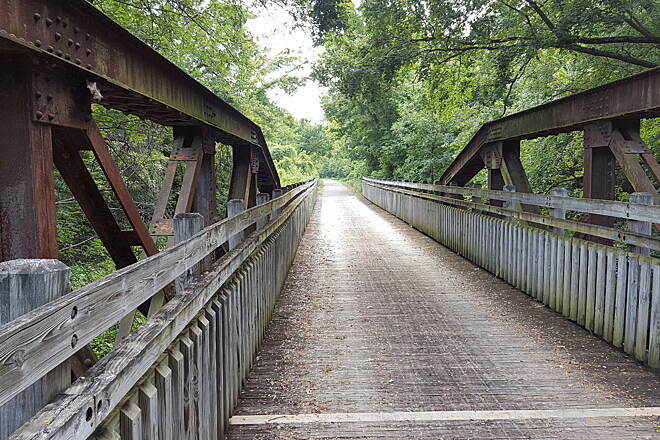 "Had many wonderful experiences on the Katy Trail. When you ride to Jefferson City, be sure to stay at the Ramada Inn. They welcome cyclists/hikers and offer a free shuttle van to/from the trail. 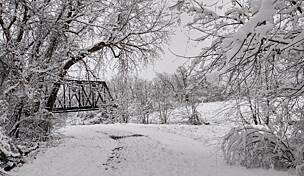 This is especially helpful because the bridge across the Missouri River lacks sidewalks. " "We jumped all over this trail, from east to west, riding about 180 miles of it. The central portions along the Missouri River were the prettiest and also offered the greatest variety of terrains. The trail was reasonably easy for our 32mm tires. 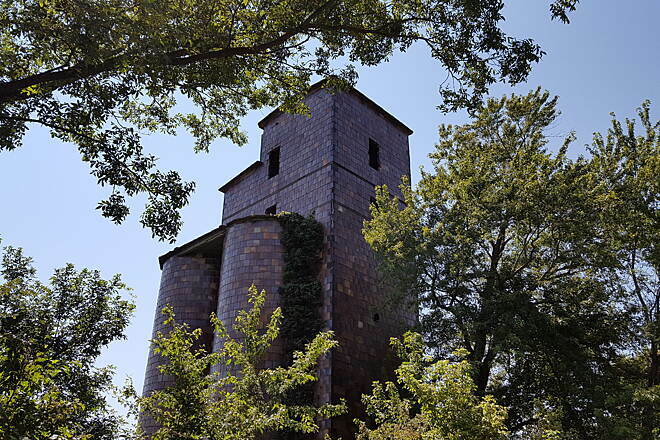 It's a mixed bag closer to St. Louis, but there are some scenic spots there, too. Accommodations in the small towns along the trail were fine, and service was always friendly." "The trail is superb for MTB street style tires. Roadies needn't worry too much though, it's smooth enough that a quality 23mm wide tire should tolerate it fairly well. I rode 25 miles both directions from Jefferson City and if the rest of the trail is of equal condition, I can't wait to ride it end to end some time. Very scenic with river one side, cliff/farm houses/towns/etc. on the other. The ability to take this trail at any speed is awesome. Visibility is fantastic even at 40mph. Great for the speed tourer, commuter as well as the scenery hounds and the load burdened. Tons of space to pass, so even the less well-mannered speed freaks can pass safely. Awesome trail - now go ride it!" "KATY Trail Journal, 5/11 to 5/14/2001"
The first section is very gently rolling prairie, almost no hills. 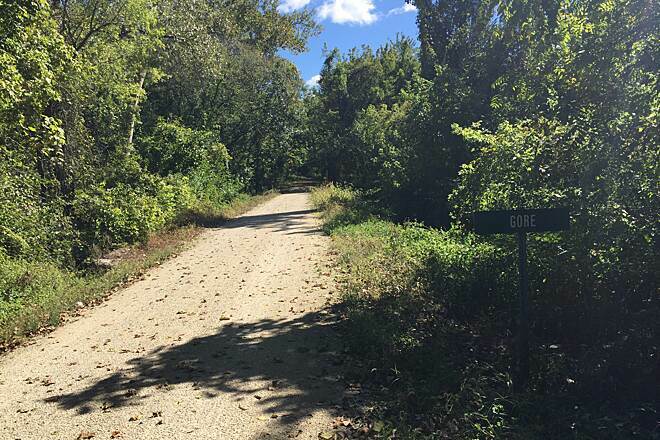 Highest elevation on the Katy trail, 950' above sea level, is near Brown, MO, MM 243; no marker. A ridge is evident as you approach from the west. From the Train Depot to the NE corner of Sedalia, where the trail is picked up, is well marked with street signs, bearing the KATY insignia. Out of Sedalia, I encounter a nice gentle down slope section and make good time. This is followed by 3 (or is it 4) hills, that slow me to 8mph going up, and 15 - 17 mph down; the ups are definitely longer than the downs! Beautiful sunset! But . . . not at Pilot Grove yet! But the twilight persists, and I arrive at 2015, odometer 1090, MM 203.3. Stay at JD's B&B. Friday metrics; 61.5 miles in 5 hours 55 minutes, average 10.4 mph. 1000, I depart Pilot Grove, and start east on the trail, two blocks from JD's. Odometer is 1091, again, MM 203.3. I cross over I70 at about 1035 near MM 196. 1055, I arrive in Booneville, odometer 1102.5, MM 191.8. This is a beautiful section of the trail, with many tree canopies over the trail. Trail traffic was light, even though I'm near Booneville, and the day is beautiful and in the 60's and 70's. I pass 6 cyclists going west, and one passes me going east; that's it. A few walkers too. Lunch at the Main Street Café in downtown Booneville, about 2 blocks from the bridge over the Missouri - from here on, the trail follows the Missouri to St. Charles. Leave Booneville at 1140, odometer 1103.4. After crossing the Missouri on the Hiway 40 bridge, the trail traverses river bottoms, with little of interest to note. Join my first rock bluff on my left at odometer reading 1112. Arrive at the MKT tunnel (about 100 yards long) near Rocheport at 1242, odometer 1116.4, MM 179 resulting in a 13.5mph average. 1330, leave Rocheport; odometer 1117.0, MM 178.3. Saturday metrics: ride time 5 hours 35 minutes, 51 miles, for an average of 9.1 mph. 0830 - leave Hartsburg, odometer 1142, MM 153.6. Pass Jefferson City - the skyline is visible to the south. The trailhead is pretty busy with both walkers and cyclists. Chat with several riders at the trailhead. Ride with a local Stationary store owner from near Jefferson City to Mokane, where we have lunch at a store on main street, about 2 blocks from the trail..
Leave Mokane at 1145, odometer 1170.6. This stretch is the most desolate and remote of the trip. Few roads, few houses, no other riders. Flat front tire! 1240, odometer 1179.3, near MM 117. Takes me about 45 minutes to find, patch and reload, then on my way. 1535, arrived McKittrick, odometer 1195, MM 100.8. Arrive at Meyers' Hilltop Bed&Breakfast; great hosts, a great place to stay, they make you feel at home! They transported me across the very narrow Hiway 19 bridge so I could eat dinner in Hermann, immediately across the Missouri. Dinner at the Wild Grapevine was outstanding - from appetizer to dessert. Sunday 5/13 metrics: elapsed time 6 hrs 55 minutes, 52.8 miles for an average of 7.6 mph (don't forget the flat!). Breakfast at Meyers was outstanding! low fat oatmeal pancakes, 2 eggs, fresh squeezed orange juice, coffee, and fresh strawberries. 0835 - left McKitrrick, odometer 1196.8, MM 100.8. Arrived Trelor at 0945, odometer 1213.2, MM 84.4. 16.2 miles for an average 14.1mph. Impressive Mercantile Bank Building. Now houses the Mercantile and the Treloar Post Office. The Mercantile is having their grand re-opening on 6/2/2001. Leave Marthasville 1100, MM 77.7. Leave Augusta 1208, odometer 1232.1, MM 66.3. Leave Defiance 1300, odometer 1240.4, MM 79. Cross under I64/40 at odometer 1248.2. 1431, arrive St. Charles, odometer 1260.5, MM 39.5. 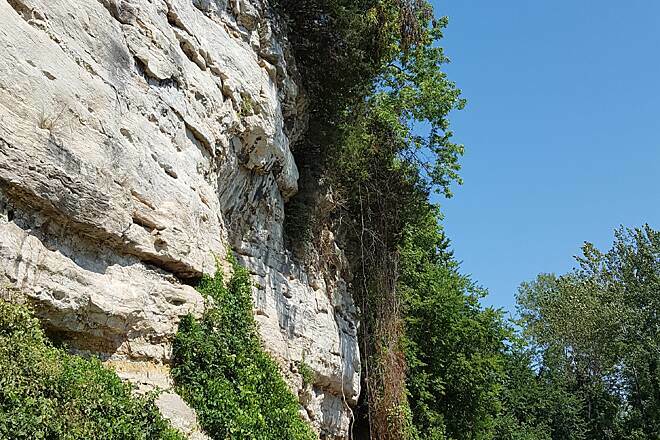 "For scenic views, the best part of the trail that I have seen is the several miles east of Rocheport to the crossing of Interstate 70. The trail runs along the base of a bluff above the Missouri River. 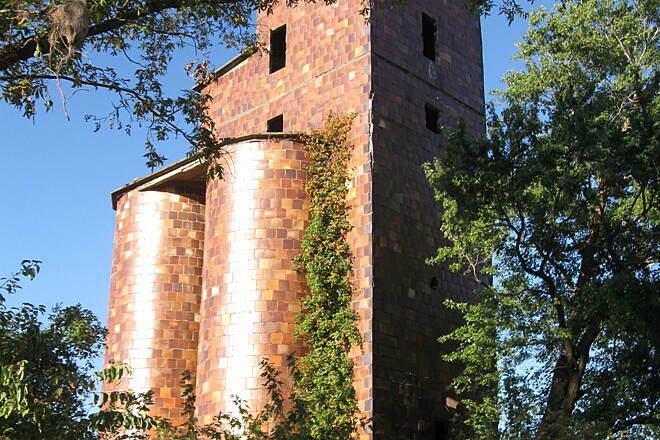 Rocheport is a small town with several bed & breakfast inns. 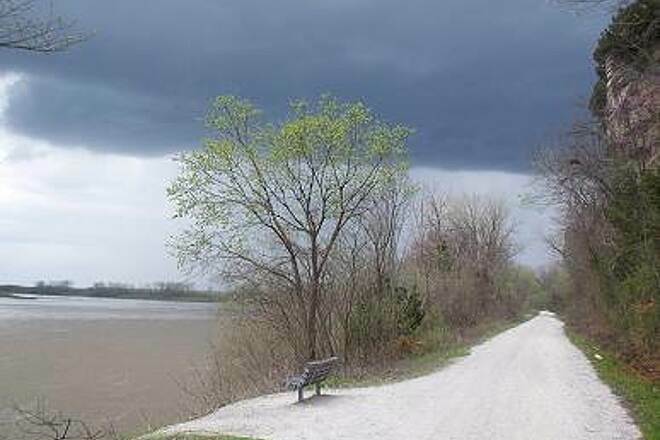 Another scenic segment is in the Augusta area, where the trail also runs along the base of a bluff, although the Missouri River is usually not visible and excessive growth of high weeds along the trail can restrict the view. Augusta is a small town (at the top of the river bluffs adjacent to the trail) with some decent wineries. Rode trail from St Charles to Sedalia. Had a good time but I would suggest if your going to ride the whole thing to do it after March. We did it March 18-21 and very few places in between the major stops were open for business yet. Thank goodness for trail mix and granola bars!